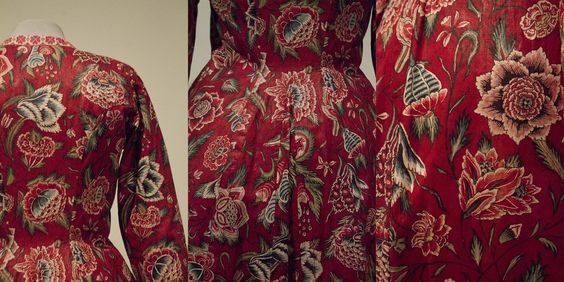 For most historical costumers, finding the perfect fabric is one of the most difficult parts of getting the look right. One of the main difficulties is that many fabrics used in the past just aren’t made anymore in the same quality, or they are too expensive for a hobby seamstress. Just finding really fine linen is nearly impossible. 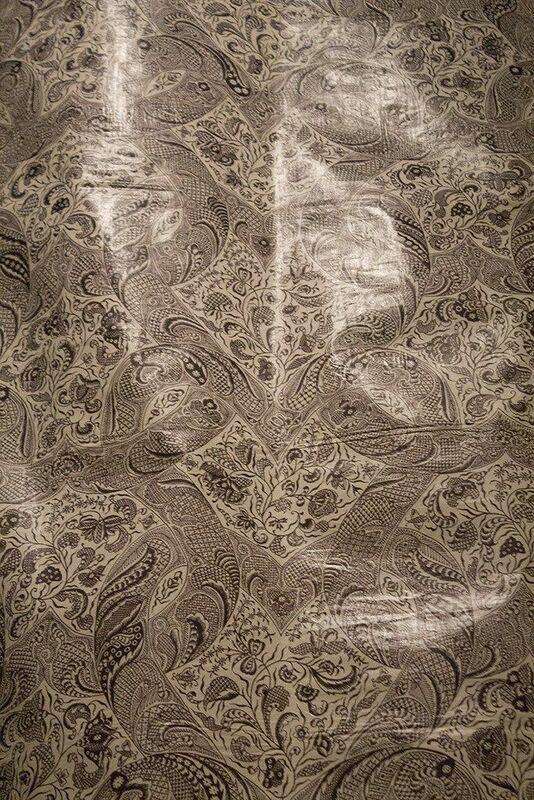 One of my favourite historical fabrics is wool damask. And it’s another of those fabrics which has sort of died out. It just isn’t made anymore, which is a shame, because it’s stunning. Yes, that’s wool. Wool damask is two-toned, and pretty much always in the same color palette. So you get a lighter/darker combination, so light green with dark green, dark blue with black, or beige and brown. Wool damask is also usually glazed. 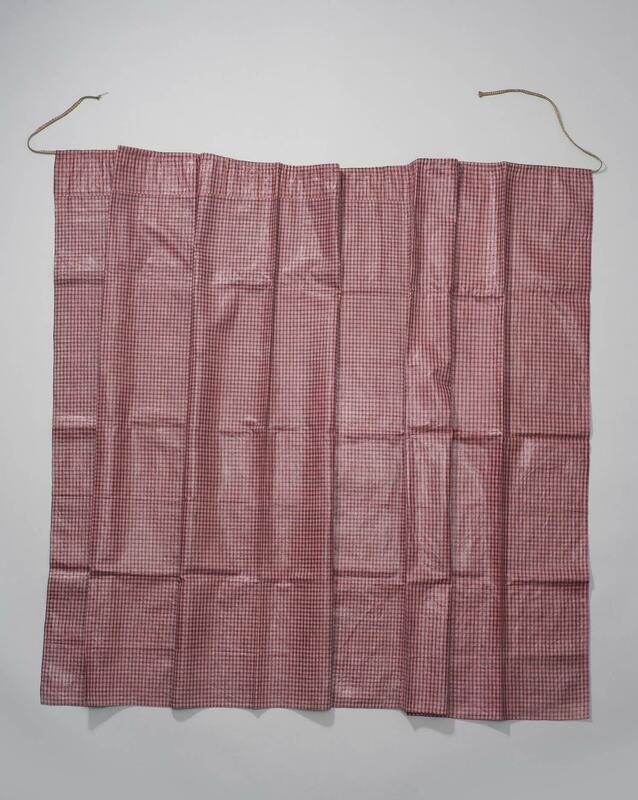 It’s treated in such a way that it gets a shiny finish, making it almost look a bit like silk damask. It would’ve been a cheaper than true silk damask, but gives the same impression. 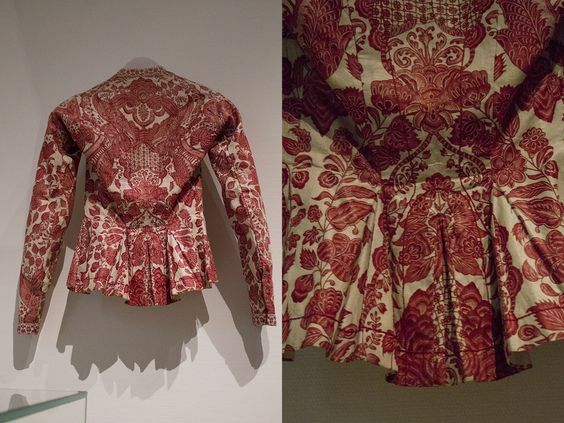 The patterns of the damask were definitely inspired by their silk counterparts. 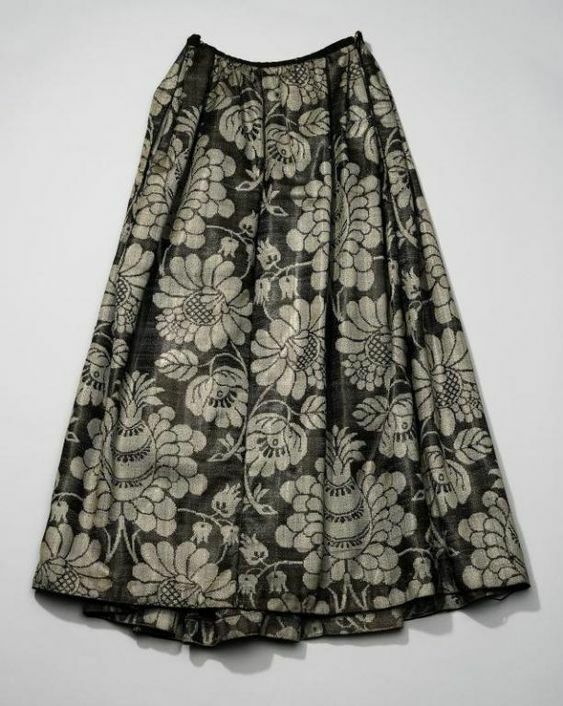 Wool damask was used for skirts in the 18th century, and continued in traditional clothing throughout the 19th century. They were probably often also worn as petticoat under the upper skirt, as they’re a little less fancy than the silk ones. Some of them are pretty stunning though, so I definitely think they were worn as upper skirt as well. Look how shiny! 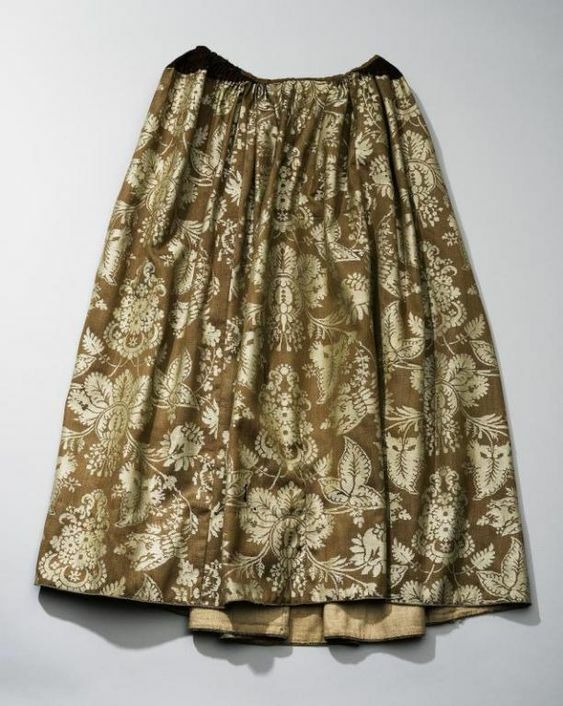 The wool damask was used mostly in skirts, but also in men’s waistcoats and in stays. In some regional wear parts of the stays were visible at times, calling for fancy fabrics. The richer farmers would’ve worn wool waistcoats as well. 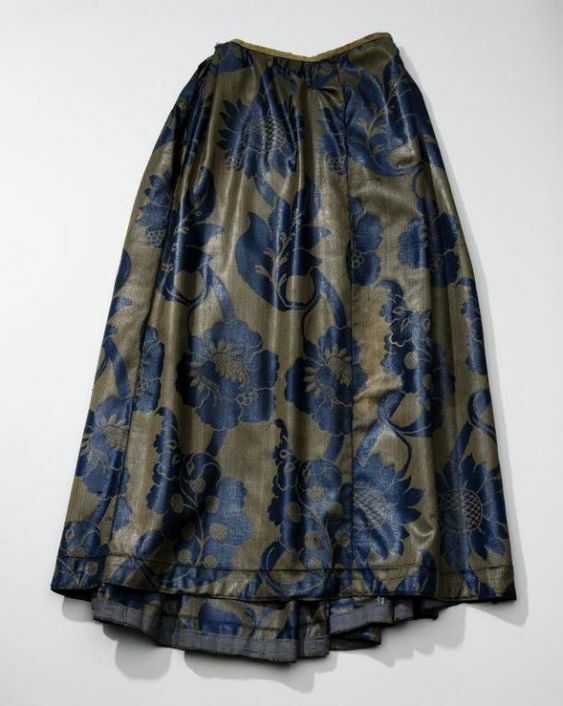 One of my more prized possessions is a black wool damask skirt, probably from the late 19th or early 20th century. This one is from the Veluwe, where these skirts were still worn as petticoats (underneath a plain black skirt) with the traditional costume. It’s constructed pretty much the same as an 18th century petticoat would be. It’s gathered at the top, with a flat front, and two side slits. It’s got one tuck in the skirt, and a velvet band a little above the hem. The bottom has got a bit of fluffy trim to protect it, and it’s got another ribbon as well as a hem facing on the inside to protect the fabric. A close up of the fabric, left from the outside, right the inside. The top is tightly cartridge pleated to a waistband. 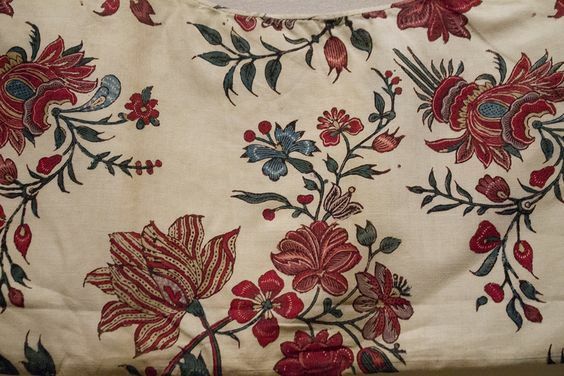 Despite the age, the fabric is still very pretty. 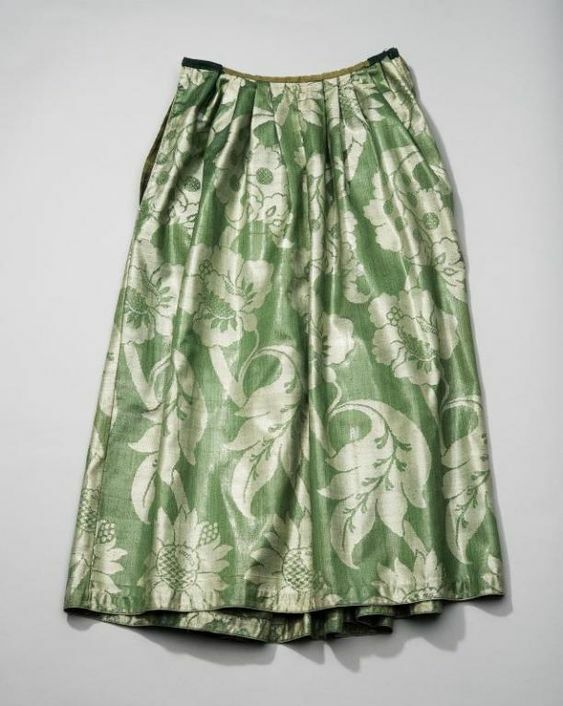 The velvet trim and hem facings clearly show wear, but the main skirt is still in very good condition. This was another reason these skirts were so popular, the wool fabric wears very well. If only they still made fabric like this today! A little while ago, I bought an old oorijzer online (more about what that is here). You see them for sale regularly, but they’re generally the most ‘modern’ incarnation of an oorijzer, as worn with traditional clothing. These types of oorijzers are also generally very expensive, as there can be quite a bit of gold and silver in them. Some of them are practically solid gold helmets. The oorijzer I bought caught my interest as it was brass (so: affordable), and it was both narrow, and didn’t have any ‘attachments’ to the front. These attachments are practically always present on oorijzers from the 18th century onward. As I bought it I had some hope it’d actually be a 17th century one, but alas, it shows signs of breakage at the front. So it did have something attached to the front. I suspect this was silver of gold, and simply removed to be sold separately. An example of an oorijzer of silver, with golden tips. As mine doesn’t have a maker’s mark, it’s practically impossible to determine the age. The example above is made in 1899, while the one below is from 1640. See the difficulty? The basic shape stayed almost exactly the same in some areas of the country. Dating happens based on the maker’s mark, and the attachments to the front, both of which are missing. An early oorijzer from ca. 1640. Nevertheless, I’m quite happy with my oorijzer. Without the attachments at the front, it really does look and work like a late 16th/early 17th century one would. It has got the little holes on the ends (for pinning your cap in place). Most of the 16th century oorijzers don’t have that second feature, but other than that they actually look really similar to mine. Plus, the holes come into play in the 17th century at some point, as the previous one shows. A slightly clearer view of the tips, including three little holes for the pins. Most oorijzers of that period don’t really show, only maybe sometimes the ends. They’re very much useful items at this point in time, they serve to keep your headwear in place. This is a rare period view of an oorijzer without a cap. This invisibility also means I could use mine for the same purpose! 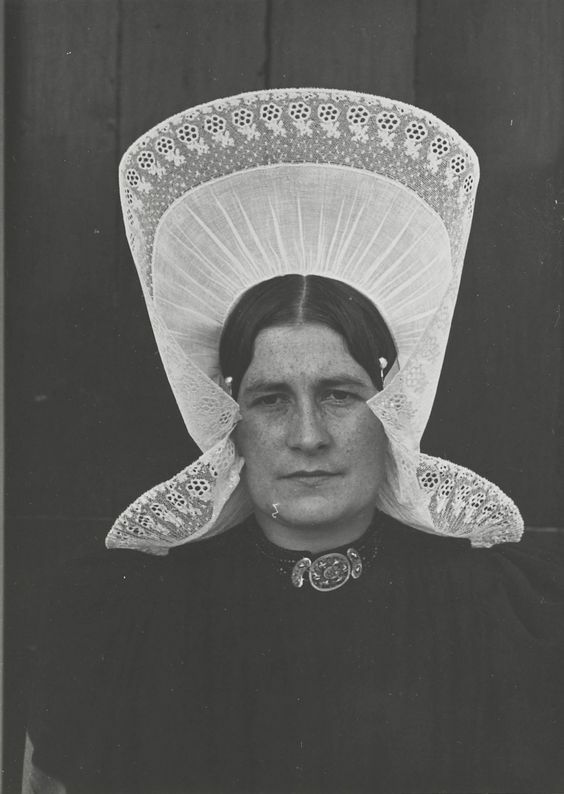 Many of the different types of headwear in the Netherlands in this era require an oorijzer to look good. As I now own one, that opens up new possibilities. I don’t have any concrete plans, but I definitely want to make something to wear my oorijzer with some day! To end this post, some lovely images depicting women wearing oorijzers with different caps. No, you mostly cannot see them, but look for how the cap sits very closely to the cheekbones, sometimes almost pressing into the cheeks? That effect is nearly impossible to achieve without an oorijzer. As we know they were worn widely during this era, I feel safe to say that they are in fact wearing one. And a simple white coif, this time you see the oorijzer sticking out. In this one, the compression in the cheeks is very visible. You cannot see the oorijzer, but you see the earrings. These would commonly be attached to the oorijzer instead of the ears, as you cannot see those. Somewhat more fancy still. No oorijzer visible, but the cap is hugging the head. I have many, many more examples on my pinterest here. 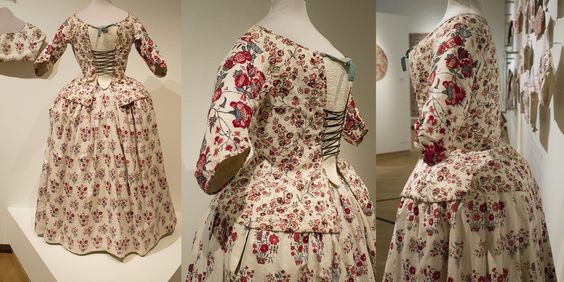 Because I love chintz (see this post for a very extensive history and background), I’m going to split my blog about the exhibition into two parts. I’ve learned some more things, and because I now have loads of photos of the lovely chintz items I can illustrate this post with! Click the image for a larger version. I’ll also work on uploading all my images and link to those in the next post, as there’s way too much for even two blog posts. For this first post: a little more about the use of color in chintz, and the various patterns. The colors and patterns or chintz are made on bleached cotton, making white the first color you see in chintz. Lines are made in a black/dark brown color. Aside from this, the main colors are often made with meekrap (red) and indigo (blue), and you see shades of red and blue a lot. Additionally, purple sometimes occurs, as well as yellow and green. Beautiful wall-hanging with tree patterns and a wide array of colors. Nowadays, we think of chintz mainly having a white ground, with colored flowers and leafs. But that’s quite a western view on chintz. Many chintzes for the Asian market were made with a read ground. In contrast, the English (and I believe also the American) market greatly favored white-ground chintz, and you barely see any colored grounds. Although the majority of Dutch chintz also has a white ground, In the Netherlands, you see a relatively high amount of chintzes with colored ground. Mostly red, but also blue, green, purple, dark brown and even ‘spotted’ ground. I personally love these, and the museum had some lovely examples. Young girl’s jacket in red ground chintz. Interesting to note is that the colored ground chintz is mostly used for blankets/spreads, sleeves, baby caps and jackets. 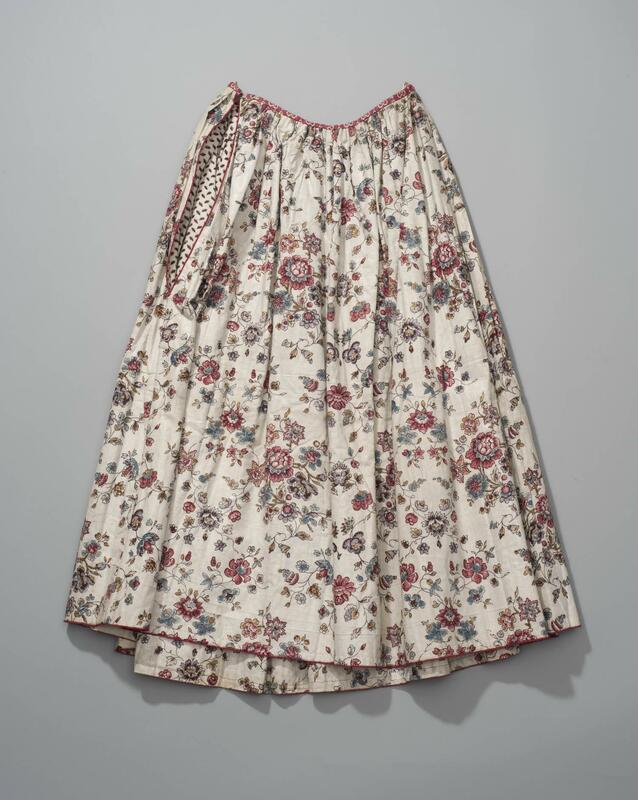 Skirts of chintz are most commonly white. All the sunhat linings in this exhibition were also with a white ground. For the kraplappen (I’ll go into their use in the next post! ), you see mostly white but also some red. 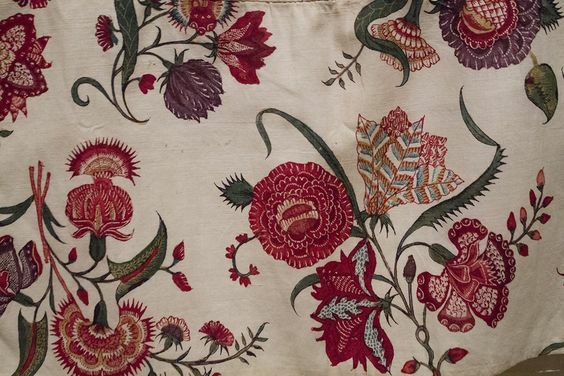 Detail of a kraplap, Indian chintz with a white ground. In contrast, the town of Hindeloopen uses a lot of red ground in their traditional costume. 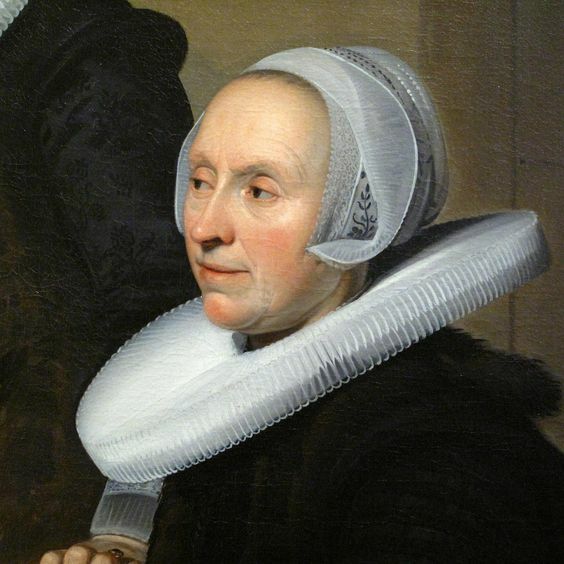 Detail of a Wentke from Hindeloopen. This might’ve been the prettiest fabric in the exhibition. 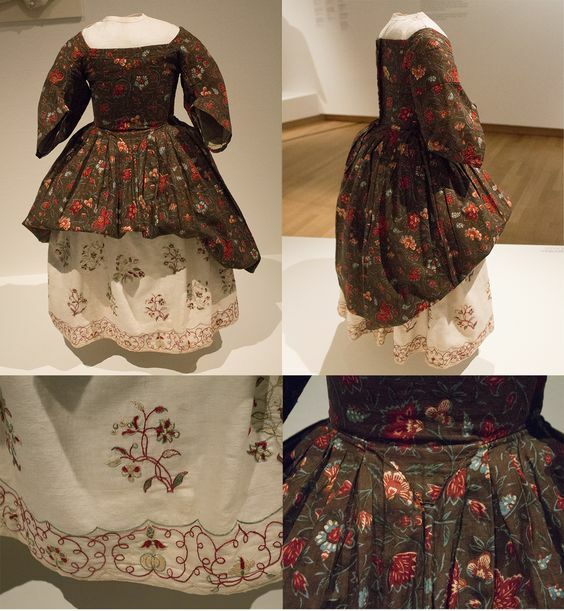 Traditionally, chintz practically always included white (either as ground or detail color), black (mostly lines), and both red and blue as main colors. 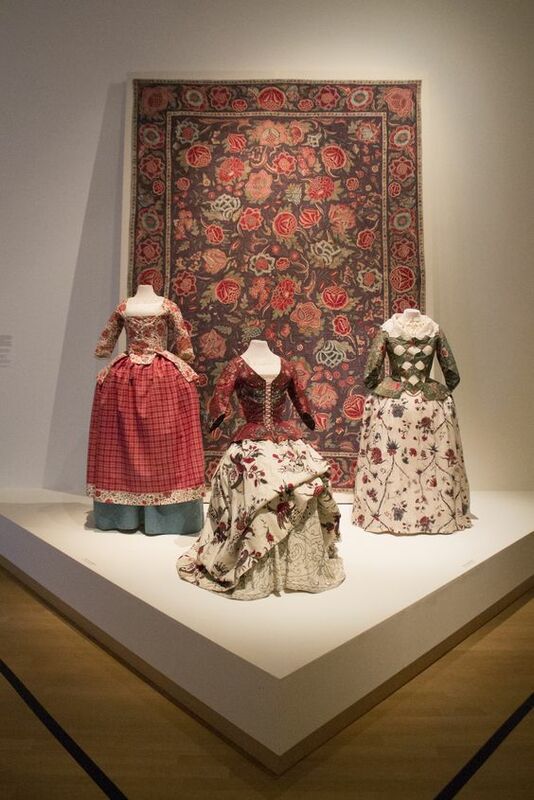 However, in the Netherlands we also have a number of two-colored chintz. White-black, white-blue and white-red. 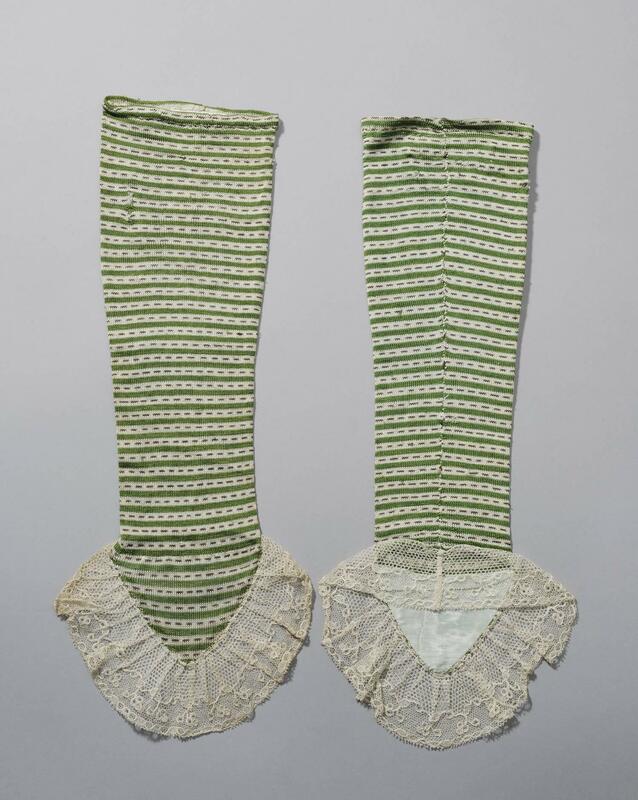 These were probably specifically made for the Dutch market, and especially in Hindeloopen worn for very specific occasions. Hindeloopen had a very specific mourning tradition, with up to 7 stages of mourning. Although chintz wasn’t worn for the heaviest stage (all black), the black-white chintz comes into play for the ‘slightly-less heavy’ stages. Back of a Wentke for heavier mourning. In an even lighter mourning stage, blue would enter the scene, and you get gorgeous white-blue ensembles for light mourning. 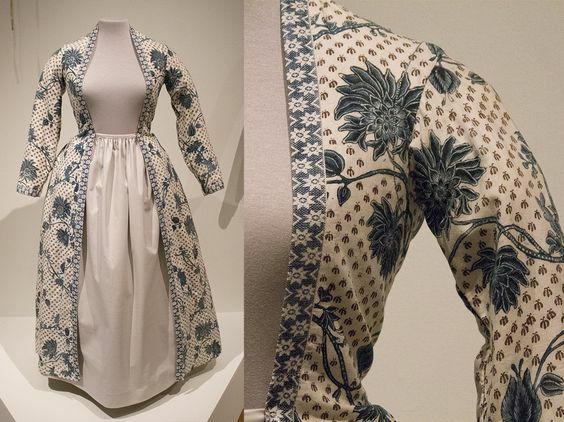 As ‘out-of-mourning’ dress was mostly red, this relatively light-colored combo of white-blue would still clearly signal mourning. Finally, you see red-white chintz in Hindeloopen as well. 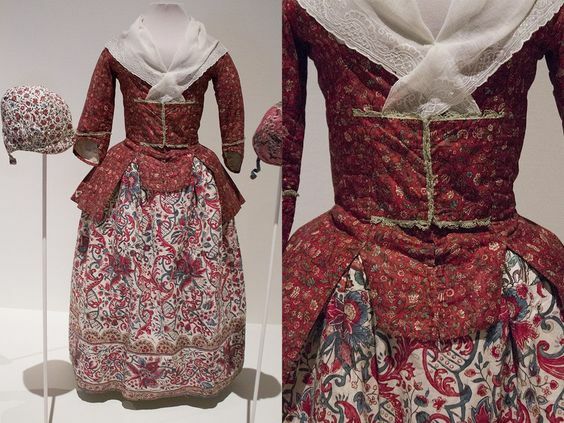 This was called ‘milk & blood’ chintz, and was worn by the bride. Something else I’d never seen before this exhibition was the use of gold. 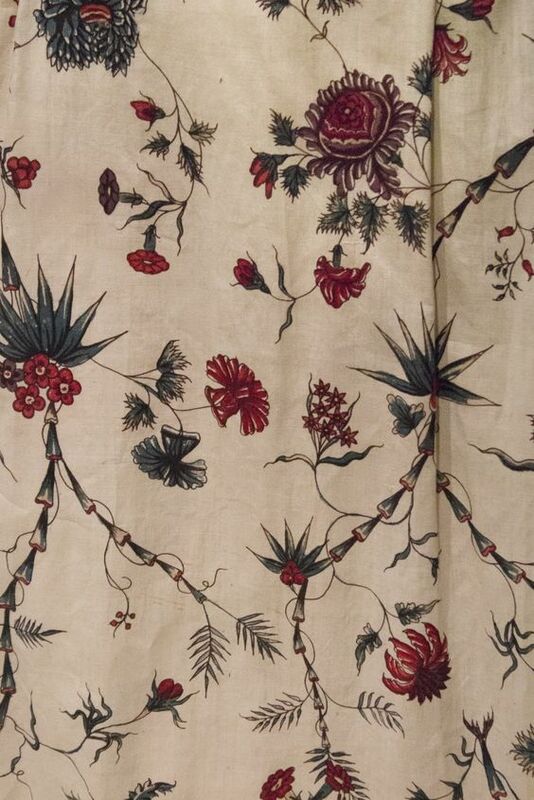 This was usually reserved for the Indian upper class instead of export, and therefore very rare in European chintz. 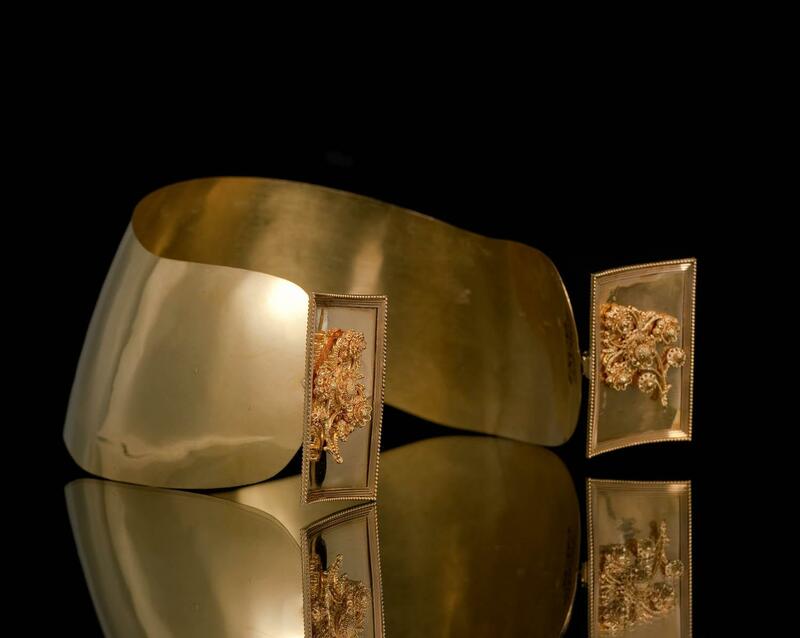 Nevertheless, the museum had a couple of sleeves and a spread with leaf gold on display. 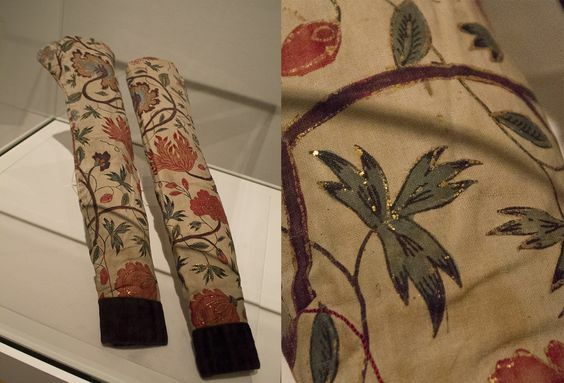 Detail of sleeves from Hindeloopen with leaf gold. Although not really a color, something very specific about chintz is it’s glaze. I’ve seen a lot of reproduction patterns which feel like chintz, but don’t have this shine. It’s gorgeous though, and definitely best experienced in person. Although some chintz has lost some of it’s shine (it can wash off), the museum had a piece of a roll which is still in an amazing condition. Piece of two-tone chintz still on the roll and in very good condition. The angle of the picture makes it catch the light. Pattern wise, all chintz has flower inspired patterns. Originally, these were very stylized and oriental in appearance. However, the European marked also started to influence Indian makers. Although it’s exoticism was a big draw of chintz, you do see it becoming just a little more European in style as well. From very large, asymmetrical patterns and stylized flowers, you start to see more geometrical patterns and more natural flowers. 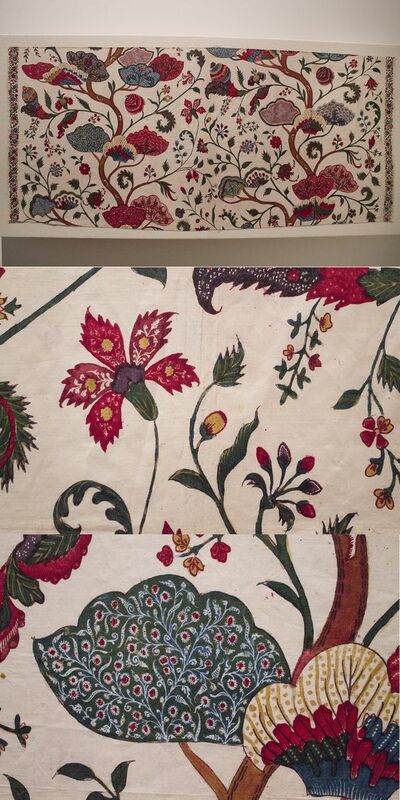 Indian chintz, flat flowers and asymmetrical placing. Back of a jacket. Chintz made in India, but the rose motif is distinctly more European looking. 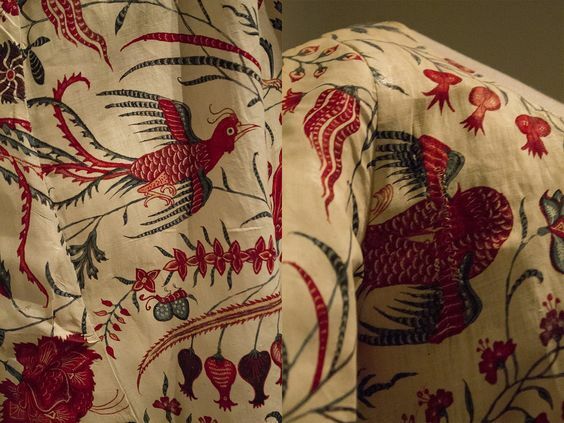 Additionally, you also get European cotton prints imitating Indian chintz. Some is of high quality, but most of the time the European prints are just a little less in quality. Detail of an informal jacket. The sleeves are made of higher quality Indian chintz, while the body is European cotton print, which would’ve been cheaper. And despite the flower theme, you get other motifs as well! Little insects and birds show up in chintz, but every now and then you get other patterns. On blankets you see heraldry, but also more animals and people. 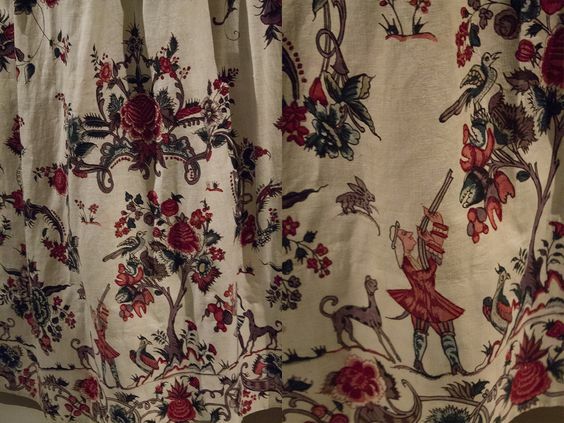 There was a skirt with hunting scenes. And one of the skirts had a very unusual border of ships of the West-Indian Company. Detail of a skirt border showing hunting scenes amid the flowers. Exotic bird on a jacket (re-made from skirt fabric). Unusual skirt border, showing ships of the West-Indian Trading company. That was it for today, in the next post I’ll go into the different items of clothing (jackets, skirts, etc), some particularities of the items and how they might’ve been worn. I’ll also include a link to all my pictures in that post, as I have way more than fit into a blog! Time for part 2! In my first post about oorijzers I shared the history, what the original oorijzers were and looked liked, as well as one example of how they continued to exist to the early 20th century. 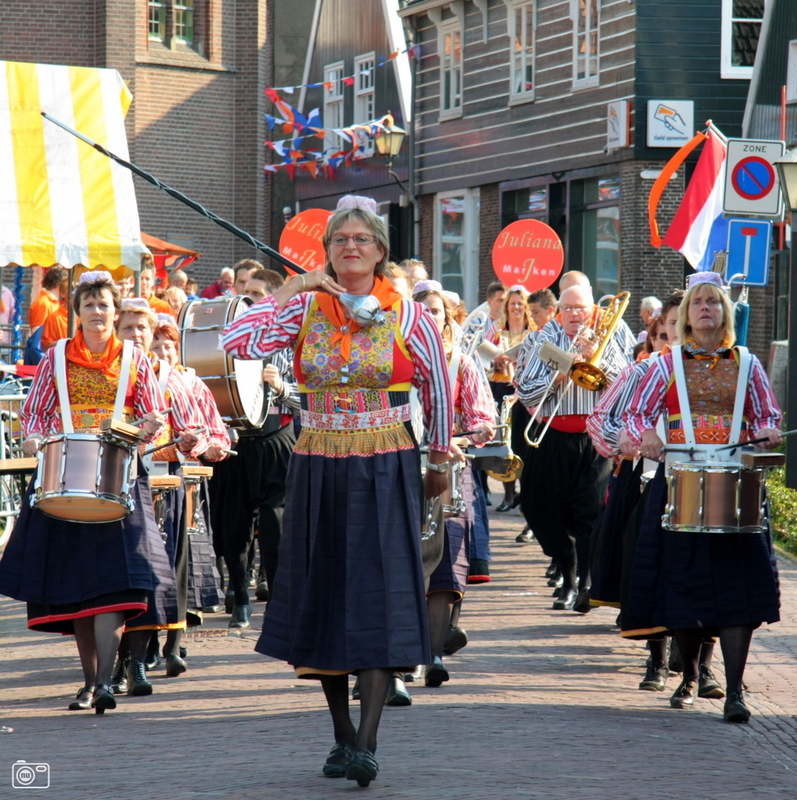 The oorijzer is currently best known for its part in various regional costumes in the Netherlands. So for this post, an attempted overview of how and where the oorijzer evolved from the 16th/17th century practical object to the many variations we have today. Prepare for a lot of pictures! To start this post, a little map of places I’ll be discussing! The regions best known for their oorijzers in traditional costume are Friesland (a province in the very north) and Zeeland (a province in the very south). It stuck around in several other places as well though, surviving in the traditional costume of towns like Urk and Staphorst. These towns have their own traditional costume worn very locally. Staphorst sees women wearing traditional clothing on a daily base up to today. The oorijzer evolved in different ways in different places, so you can usually tell which oorijzer comes from which place and which period. I’ll be discussing the most well-known of traditional costumes with oorijzers. Just as a quick disclaimer, these aren’t the only places with an oorijzer in the past of their traditional costume, just the ones most familiar (to me) and well known. Let’s start with the costume from the Zaanstreek. This is a region above Amsterdam and the traditional costume died out in the early 20th century. It had it’s own typical headwear, which stayed nearly the same during the 18th and 19th centuries. The rest of the clothing largely kept following regular fashion. The oorijzer was gold, quite a bit wider than the 17th century version and has large golden plates to the sides. 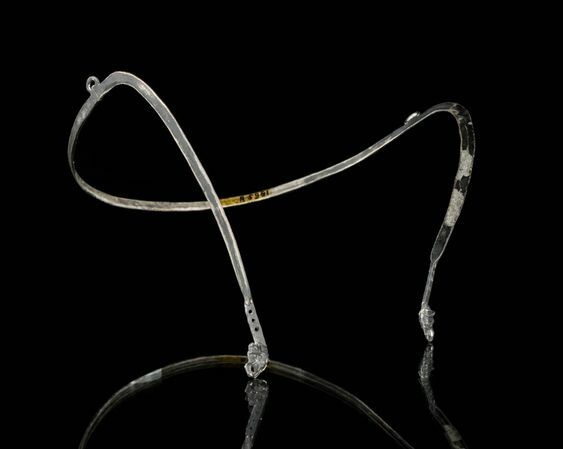 Its worn fairly straight across the back of the head and is not so much a practical thing as a piece of jewelry. An oorijzer from 1834. You can see the gorgeous filligree on the plates. And a picture from the costume group the ‘Zaanse Kaper’, this is a reproduction of the 18th century costume. 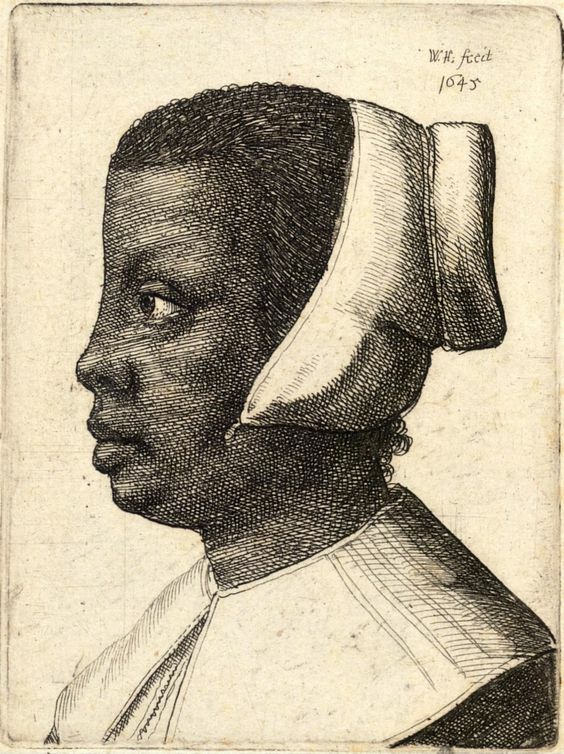 She’s also wearing a ‘voorhoofdsnaald’ (the thing across her forhead), two ‘zijnaalden’ (the two ‘needle’ things at the top, you can only see one) and pins behind the plates of the oorijzer. These pin the cap to the oorijzer. Another village which managed to keep it’s traditional costume despite nearness to a big city is Scheveningen. Now technically a part of the Hague, it used to be a fishing village. The costume has nearly died out, being worn only by a handful of elderly ladies today. There are several groups (from museums or choirs) which keep the knowledge about the clothing alive. In Scheveningen the oorijzer today is silver with golden knobs. It has a distinctive shape and is used very much to give the cap it’s shape.The golden knobs are worn very close together high on the head. 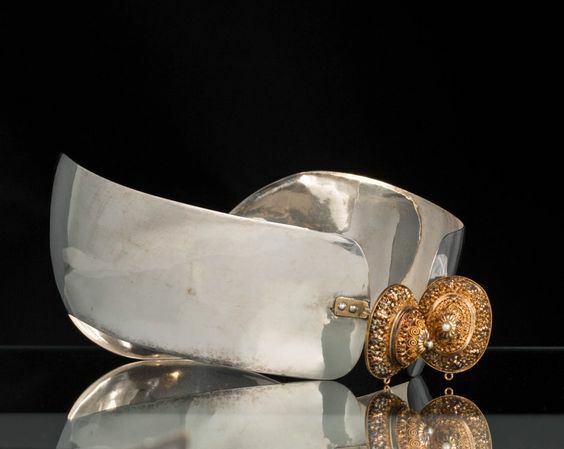 In the 18th century the oorijzer was mostly silver with golden knobs, which were sometimes decorated with golden ‘bells’, jewels which would hang from the knobs. 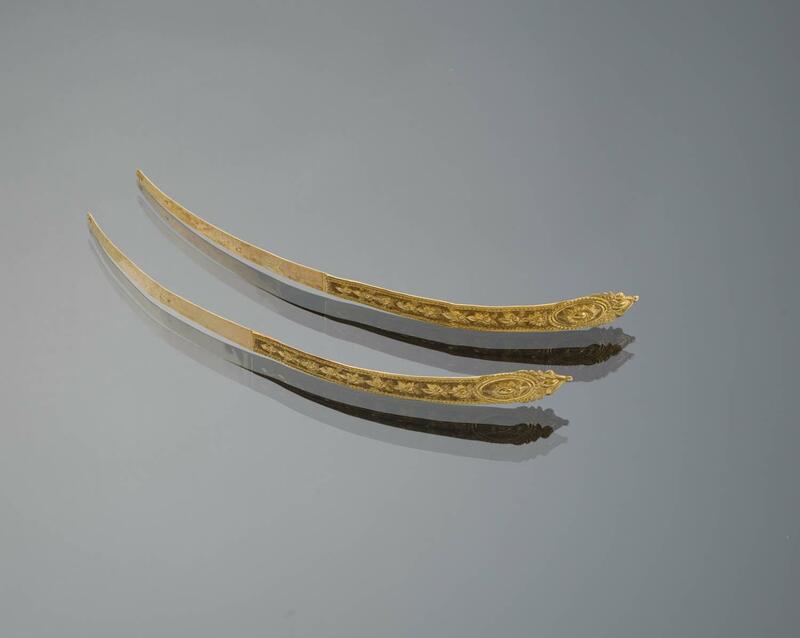 In the 19th century, some golden oorijzers also existed along side the silver ones. The knobs also took various shapes, settling on the round ones similar to the modern ones at the end of the century. This is an image from 1850 depicting the costume around that time, also showing the ‘bells’ hanging from the oorijzer in the center top. These also disappeared later in the century. You can see the different types of knobs, as well as the swooping shape the oorijzer has in the back. A lovely picture from the 1950’s showing the shape of the oorijzer and cap. The oorijzer sticks out in the back so keeping the cap in place. Next up is the town of Huizen. This used to be fishing town, before the Afsluitdijk (dike) made the inland sea of the Netherlands into a lake, and before the province of Flevoland was ‘created’. This is an image of the costume around 1850, showing a simple cap on top of a silver oorijzer with small pins through the knobs. The clothing in Huizen followed regular fashion and eventually became all black between 1870 and 1920, probably also due to religious influences. From 1870 on the cap also went through a great change, becoming the main point of interest, mostly due to its size. The oorijzer seems to have stayed relatively similar, changing slightly to accommodate the new style of cap. Two different types of large caps were worn, the ‘isabee’ for daily wear without oorijzer, and the oorijzermuts (oorijzer cap) for Sundays and special occasions. The cap with oorijzer was also a lot more difficult to put on, nearly impossible to do alone. The cap is put in place with the pins, attaching to the oorijzer. This eventually creates a type of ‘loop’ in the fabric as shown in the next image of the final cap. And an image of the oorijzer only. You can clearly see the knobs with holes to put the pins through. Another fishing town where the oorijzer survived is Urk. Urk used to be an island, before the province of Flevoland was basically created around it in the 1930s and 40s. It still very much retains its island culture today. The traditional costume has all but died out, but is sometimes worn for special occasions. 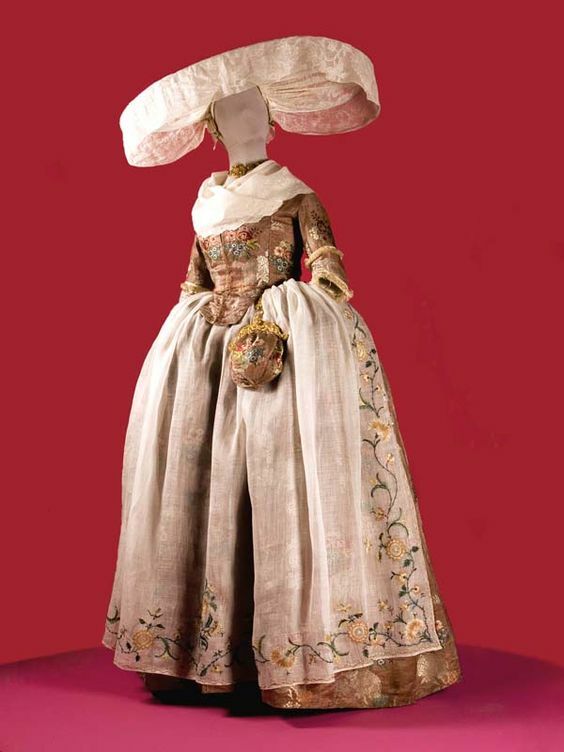 I couldn’t find any information on the 18th century costume, but this image shows the clothing ca. 1850. The oorijzer is silver with silver knobs, little pins stuck through. The knobs are worn on the cheeks. Around 1900 the costume reached its current state, the changes mostly being in the clothing. The cap changed little, the version today being a under-cap, a white cap with yellow lace at the front, pinned to the oorijzer and if the lady is married a black over-cap on the back. The red bands disappeared. The white cap and oorijzer would’ve been pinned together first and then put on. These pictures are from the early 20th century, showing the oorijzer beneath the cap. 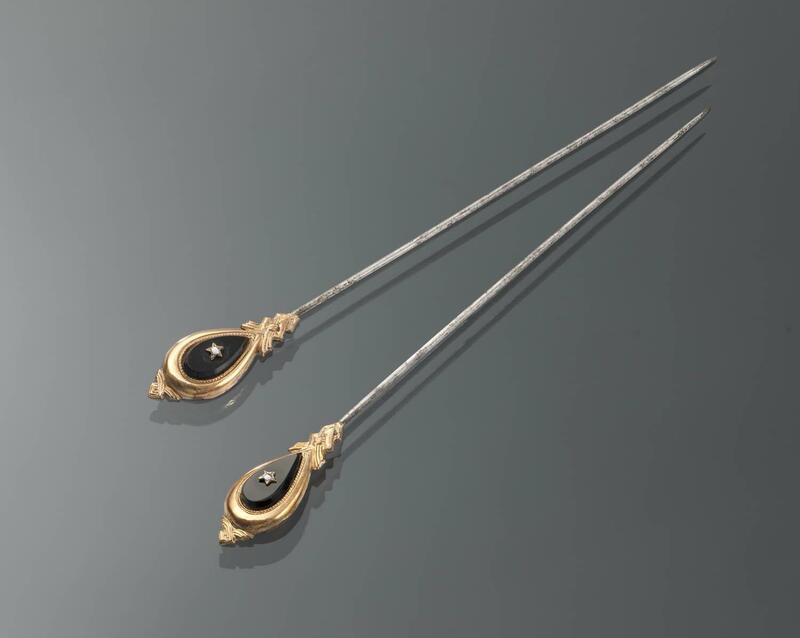 The little round balls are the tops of the pins which pin the cap to the oorijzer. The oorijzer, this one made in the late 19th century. It’s very narrow in the front, which shows that it’s meant to press into the cheeks. Staphorst-Rouwveen is a town which even today is known very much for its wearers of traditional costume. It has got the highest number of women still wearing the traditional clothes on a daily basis of the whole country, a couple of hundred today. 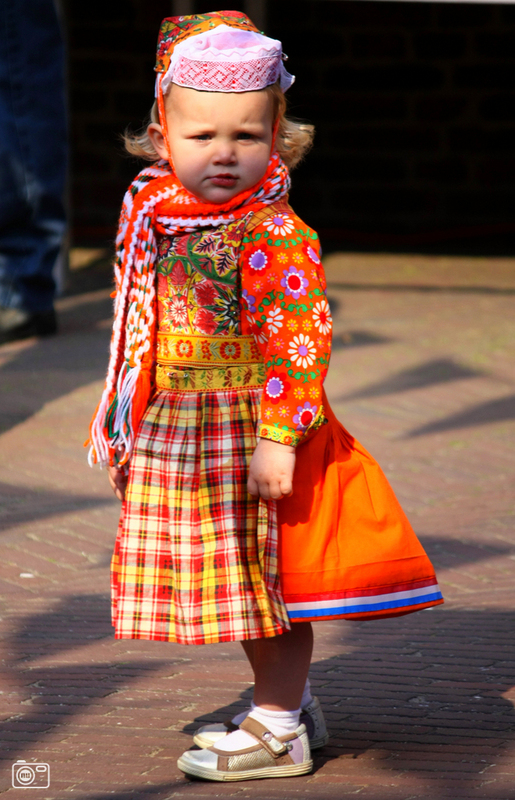 The youngest is in her 40s though, and most wearers are over 60, so also in Staphorst traditional costume is dying out. 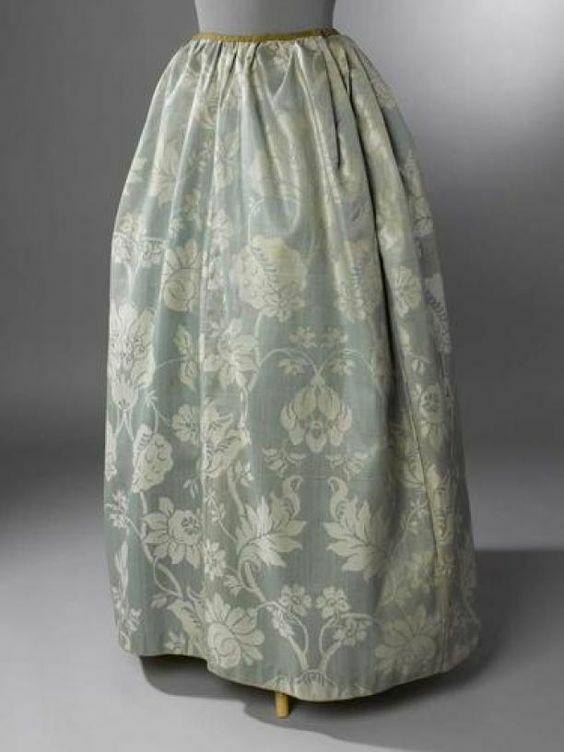 Again, I couln’t find any images from the 18th century costume. The image below is from ca. 1850 showing the headwear including oorijzer inthe top left corner. The oorijzer is silver, still quite narrow and has small golden ‘curls’ at the ends. It’s worn quite low, both in the neck and on the cheeks. 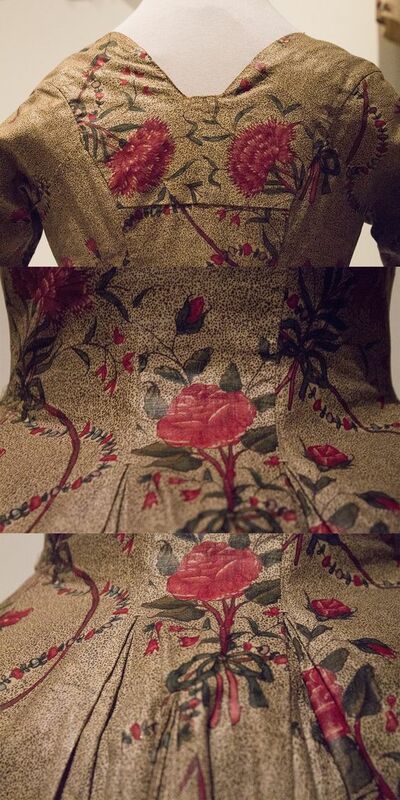 From the 1850s costume, it changed quite a bit until around 1900. After that, small changes kept happening up to at least the 1970s. As the flow of ‘new’ wearers stops, the same usually happens to the changes in fashion. Staphorst today actually sees two examples of the oorijzer. There’s a girl version, which isn’t worn daily anymore today. The other version is for adult women. Aside from the headwear with the oorijzer, another cap exists. That one is a small decorated cap of fabric and usually the daily wear today. The oorijzer is reserved for special occasions. 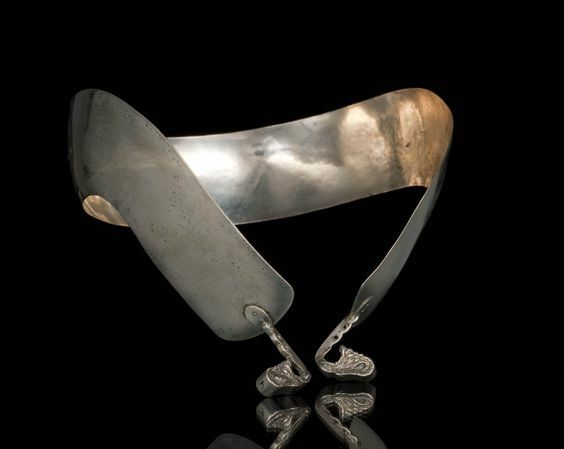 The ‘girl-oorijzer’ has the same basic shape as the one for adults, and is made fully of silver. It has very basic knobs at the ends. The girl-oorijzer, this one was made in 1909. Source: Het geheugen van Nederland. For ‘neat’ wear (opknapdracht) the oorijzer was worn on top of the black under-cap, but without a lace cap on top. 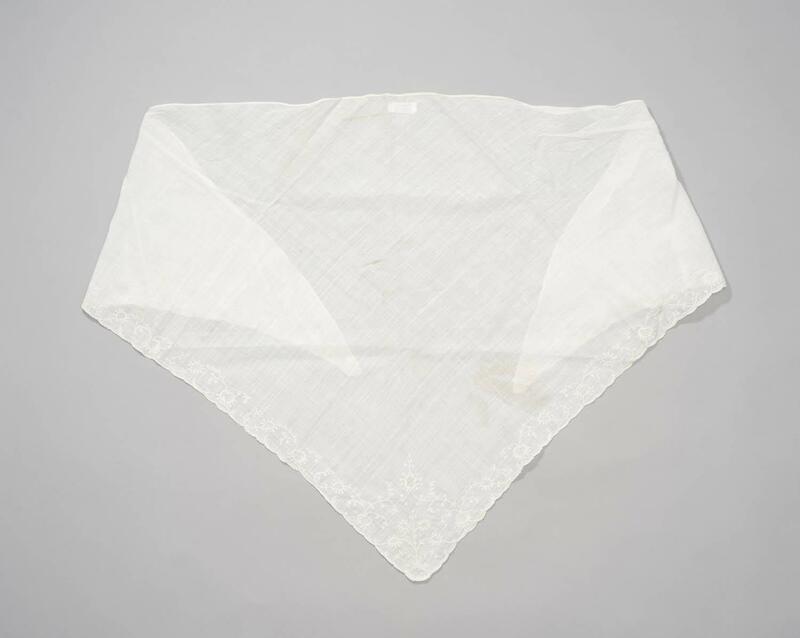 For church and special occasions, the lace ‘toefmuts’ was worn on top. 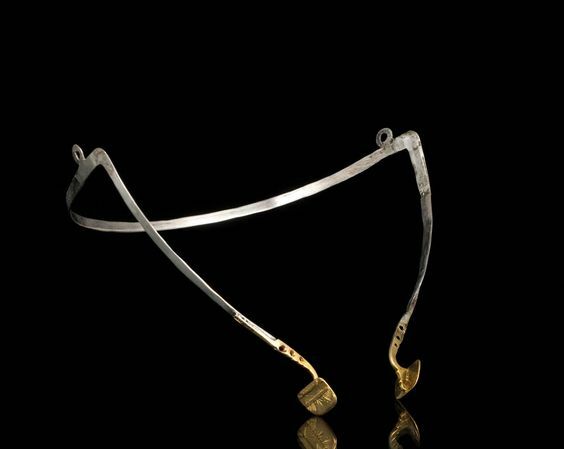 The oorijzer changed from being worn low in the neck, going up over the ears and back down, to being worn almost on top of the head, going over the ears and ending low on the cheeks. A picture of a girl in opknapdracht, picture from the 1940’s. The oorijzer for adult women is similar in shape to the girls. The knobs at the ends are different, and are replaced by golden curls. In the 1850s image you can already see small curls, but these grow bigger. This oorijzer was made in 1954. 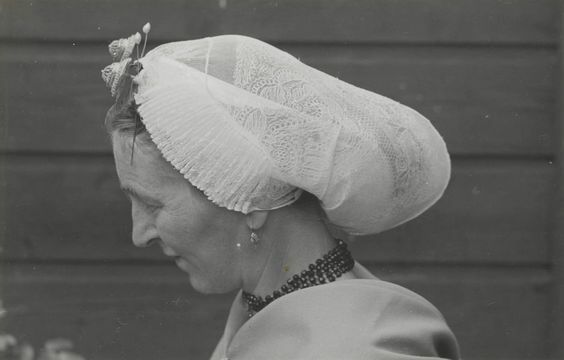 A picture of a woman wearing the oorijzer in opknapdracht in the 1940’s. And a picture taken in the 1990’s, of three women who still wear these clothes on a daily base. From left to right they’re dressed in regular, light mourning and mourning clothes, all fit for church. Friesland is a province in the north of the Netherlands, but (more so than most others) has a large ‘national’ Frisian identity. They have a flag, and their own official language. In some specific places a specific costume was worn, such as in the town of Hindeloopen or on the islands at the north. In most of the province though, traditional costume mostly took shape through the headwear while the rest of the clothing followed fashion. Friesland is one of the most interesting regions when it comes to the oorijzer. That’s because it had quite a large number of wealthy farmers, that wealth allowing the oorijzer to grow to epic proportions. In the 18th century Frisian headwear was most commonly the ‘German cap’. I’m not sure of it’s exact origins, but it grew to be quite large. The oorijzer beneath however, was still quite modest. It’s already often made of silver or gold plated. 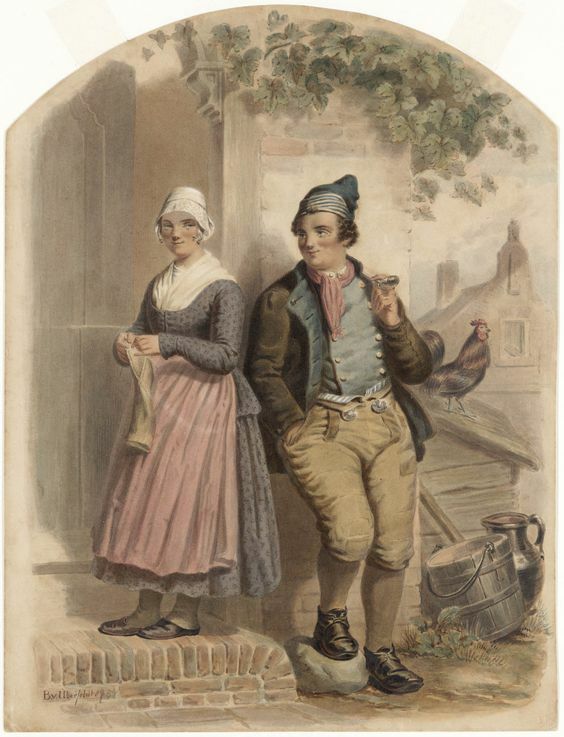 An 18th century Frisian costume with the German cap and oorijzer. An early 18th century gilded oorijzer from Friesland. At the beginning of the 19th century the cap changes quite drastically, and this marks the beginning of a growth in the oorijzer. The band becomes bigger, the knobs growing as well and becoming more ornate. 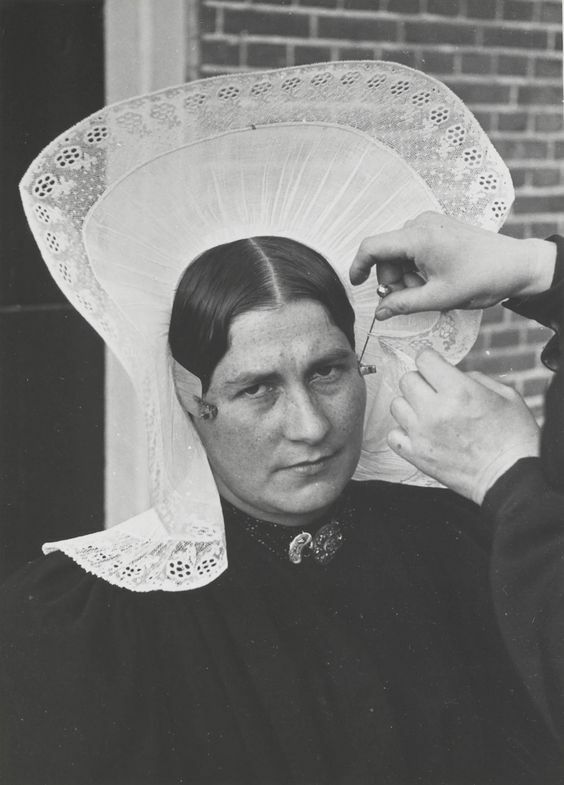 The headwear at the turn of the 19th century was named a ‘Floddermuts’. This one is for mourning, as it’s plain. The ‘regular’ one would be made of lace. Around this time, the oorijzer starts to grow. This is a gilded copper one from ca. 1800. You see that the knobs at the end grow with the band. Because the front shows best through the cap, the front starts growing first. In time the cap becomes shorter again in the back. Up to around 1850, the oorijzer keeps growing. Along with the base, the knobs at the end grow out to large ornate ornaments. Instead of a practical accessory which keeps the cap to the head, the oorijzer starts to have a more public function. Because it shows quite well beneath the sheer lace caps, your neighbors can see your oorijzer. 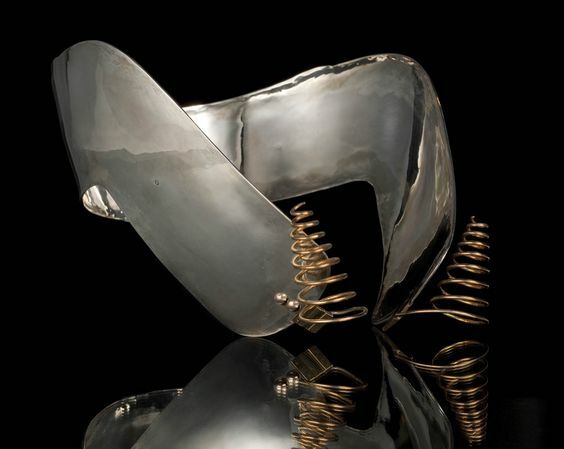 Being made of silver or gold, a large oorijzer is expensive, a sign of wealth. And of course, it won’t do if your neighbor has one larger than you. With the growing wealth among Frisian farmers, the oorijzer grows to almost be a helmet of gold. Silver was, of course also still worn in less rich families. The shorter cap. This is what the early Floddermuts evolved to between 1820 and 1880. A gilded copper oorijzer from around 1840. The fronts become larger, and the knobs start to become wider and even more ornate. A golden oorijzer from 1873. This is about as large as the oorijzers got. This one obviously belonged to a wealthy lady. 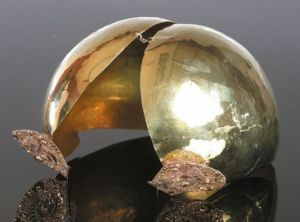 If you were not quite as rich, you could still have a large golden oorijzer, but the back would be unconnected, needing less metal. This one is gilded brass. Silver versions also existed. It would be common as well to own both silver and gold, with the gold being for Sundays and special occasions and silver for daily wear. In this one from 1879 you can again see the narrow back. The Frisian costume (i.e. the cap) disappear after 1880/1890. Quite a strong national identity exists though, so a form of the costume (the ca. 1840 version) keeps being worn at events. Nowadays you can still see it being worn in dance groups, costume groups or in the traditional coach races (with Frisian horses). Nearly all of the jewelry, including the oorijzers, are antiques and even today worth quite a lot. (After all, you’re wearing a helmet of gold). Zeeland is the province in the very south-west of the Netherlands, and mostly consists of islands. It’s probably partly due to this island culture that Zeeland evolved to have a rich variety of traditional costume. 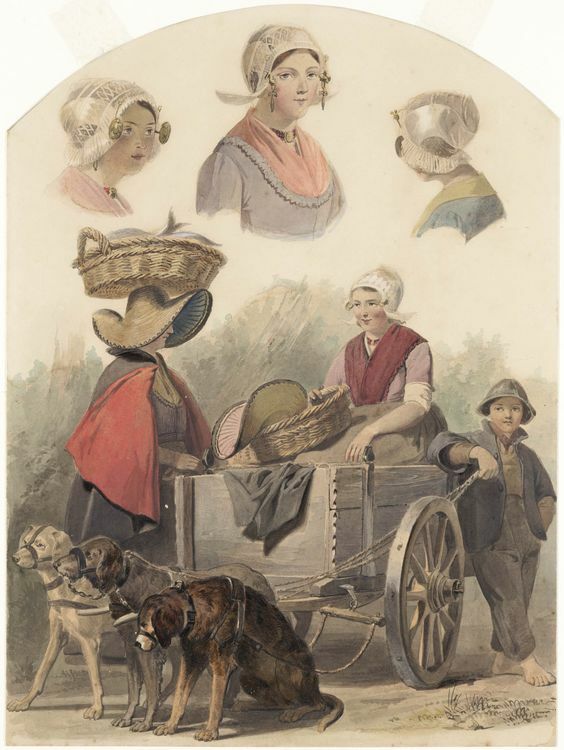 The variation in dress in Zeeland existed mostly in the headwear. Small variations also exist in dress, though mainly in the upper-body. For the oorijzer though, the 17th century version evolved into two basic variations worn throughout the province. In the 18th century, the oorijzer remained largely the same. It was silver and thin, but did develop round/rectangular golden pieces at the ends. 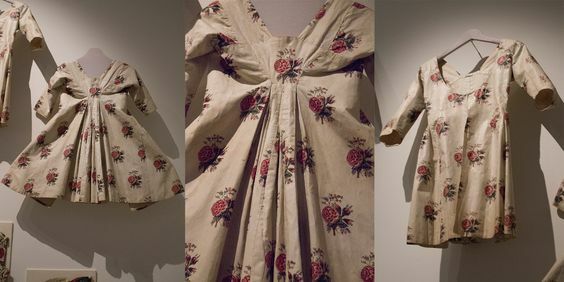 These are all images from the 18th century fashion in Zeeland. You can see the small golden oorijzers, the round balls are probably the pins sticking through. And a late 18th century / early 19th century (pre 1814) oorijzer. You can see the small golden plates at the ends. It still has the same shape as the 17th century oorijzer, and hasn’t really become wider. Before we continue, another map, this time of Zeeland. Most of the names I’ll be throwing around are the islands. Walcheren and Zuid-Beveland are two regions on the same island. Arnemuiden and Axel are specific towns. I’ll also be considering costume from just north of Zeeland, the light blue island at the top of this map. These are the islands of Zuid-Holland. Another province, but the oorijzer existed there as well and is most similar to that of Zeeland. In the first half of the 19th century, the oorijzer starts evolving in two different ways. In most of Zeeland, the knobs turn into golden curls. In Zuid-Beveland, however, they stay plates and become larger. 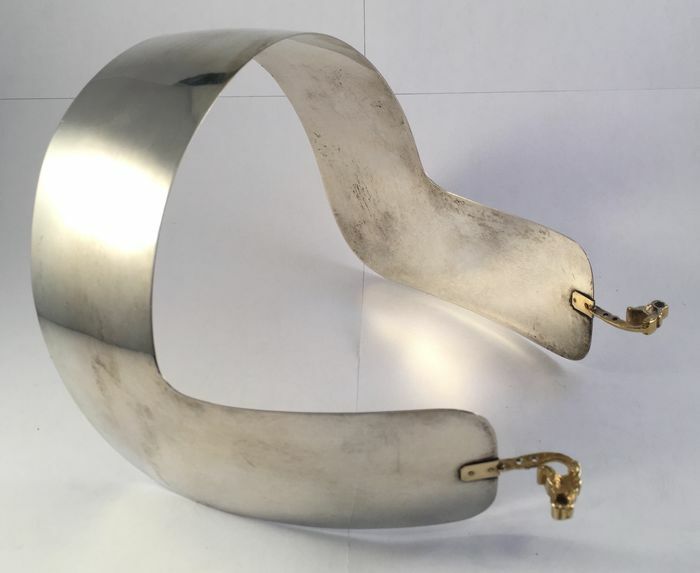 Most back parts of oorijzers are silver, though brass is also seen. The decorative knobs are generally gold, but also sometimes gilded brass. Oorijzers from Zuid-Beveland. 1864, 1886 & 1964. The first one is rather unusual, being made of filligree. Most oorijzers would be more similar to the other two, with plain golden plates. Through time, you see the plates growing in size. This reflects the growth in wealth during the late 19th and 20th centuries. Although the oorijzer in the rest of Zeeland and islands of Zuid-Holland all developed into spiraled curls, you do see some slight regional differences. In Walcheren and Axel, you get spirals which are even in size. As well as with the plates, you do also see them growing slightly over time, although they keep the 4 tiers. An interesting case is the town of Arnemuiden. At some point the back part of the oorijzer disappears, leaving only the curls. This happens exclusively in the town of Arnemuiden. These ‘curls’, as they’re called (this term is also often used for the whole oorijzer by the way), are pinned to the bonnet. You see here that all practical function of the oorijzer has gone, leaving only the decorative part. 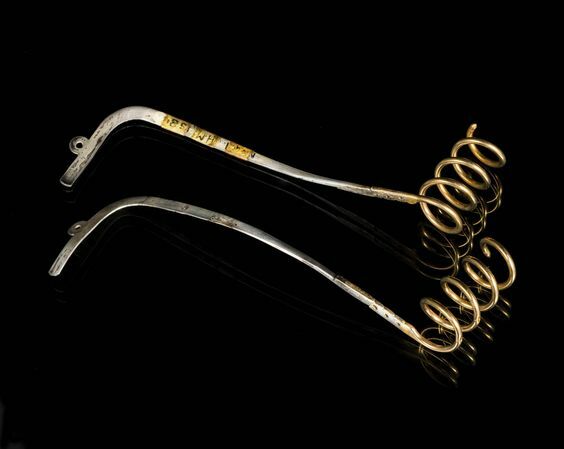 A pair of curls made in 1909. In Noord-Beveland, Schouwen-Duiveland and Tholen you get spirals with 4 tiers, but decreasing in size. The process of growth is similar to the other regions. The twisted spiral seen in the oorijzer of Tholen was typical for this island. In the islands of Zuid-Holland, you also see spirals decreasing in size as they go upwards. Unlike the spirals from Zeeland, however, these are not limited to 4 tiers. Over time, they get more and more spirals. 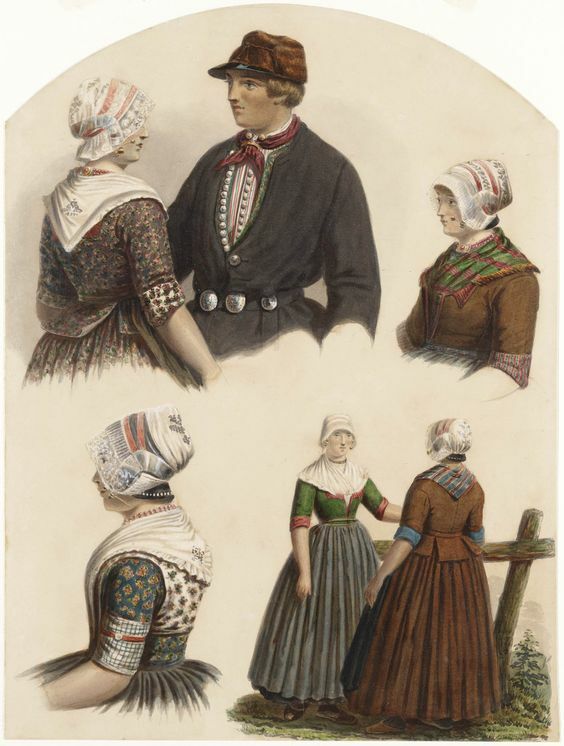 These following images all show the oorijzers as worn with the different costumes in Zeeland and the islands of Zuid-Holland, throughout time. Most of these images will show the costume and cap as worn on Sundays, this being the most elaborate version. The most recent images for each costume are also roughly where the changes stopped. This is different per region, depending on how long the costume was still worn. The only one being worn daily today is the one of Arnemuiden. Zuid-Beveland. On the left is a print ca. 1850. Next to this you see the 2 different ways the cap evolved. Top row is protestant, first image ca. 1905, second one is ca. 1940. 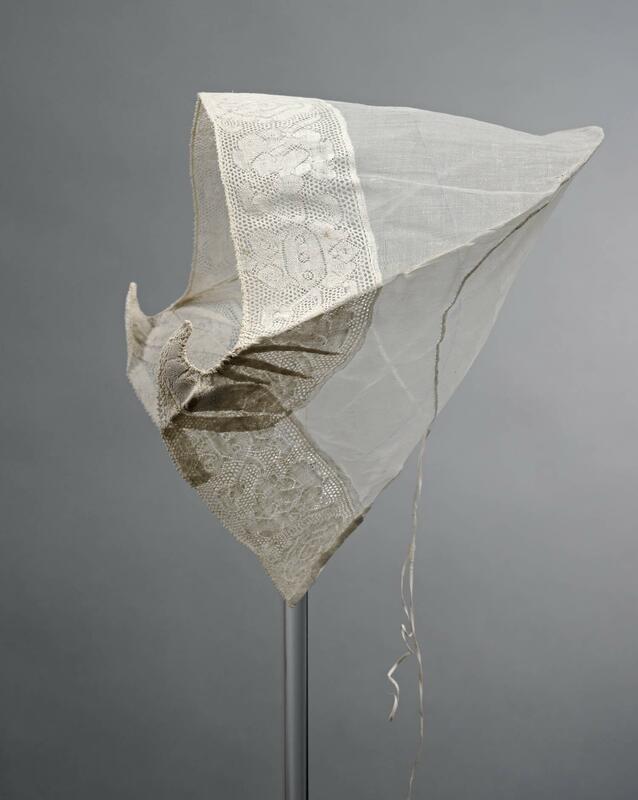 The catholic cap is in basis the same, but folded and pleated differently to get a different shape. The first image is ca. 1900, the second one ca. 1950. You can see how the oorijzer was worn much higher on the head than before in the catholic version. Walcheren. On the left the costume ca. 1850. Top right is an image from what I’d guess to be early 20th century. The girls on either side are wearing the ‘girls-cap’, with the long back. The cap in the center is the one generally worn by adult woman. Lower right shows pitures from the 1950’s. Left the adult cap, right the girl cap. Arnemuiden. Left the costume ca. 1850. In the middle a girl ca. 1890. On the right the cap ca. 1930. This was roughly the size the cap stayed afterwards. Axel. To the left an image depicting Zeeuws-Vlaandren ca. 1850. Top middle is a woman from Axel ca. 1880, bottom middle girls ca. 1905. The right image was taken in 1950. Noord-Beveland. Left ca. 1850. Top right is ca. 1900, bottom right 1950’s. Tholen. The Bing & Braet series doesn’t cover Tholen, so on the left a print from 1874. On the right a woman in the 1950’s. Schouwen-Duiveland. Ca. 1850 on the left, ca. 1910 on the right. The hair was typical for Schouwen and worn slightly different in Duiveland. Islands of Zuid-Holland. 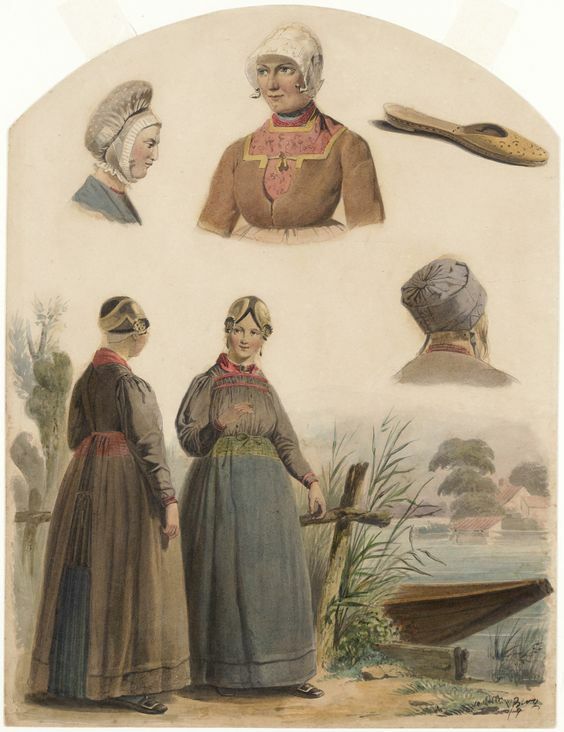 The left image depicts the costume from Goeree Overflakkee, Voorne, Beijerland and IJsselmonde ca. 1850. In the middle a girl from Voorne ca. 1880, the right image was taken ca. 1910. This post turned out slightly longer than anticipated, but I wanted to be complete, so I hope it wasn’t too long. This concludes the post. 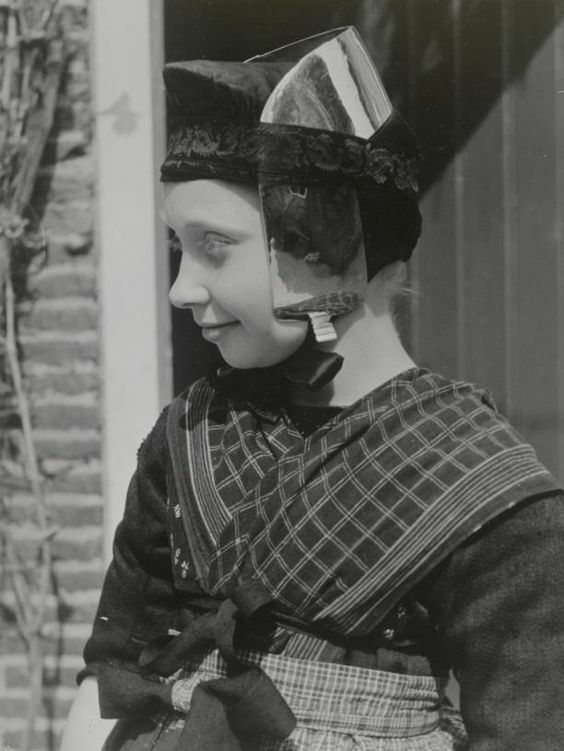 Below some sources, by far most information and images were taken from the website ‘Het Geheugen van Nederland’, which has a large image archive about Dutch traditional costume. This includes wonderful information from about the objects, from the museums they belong to. 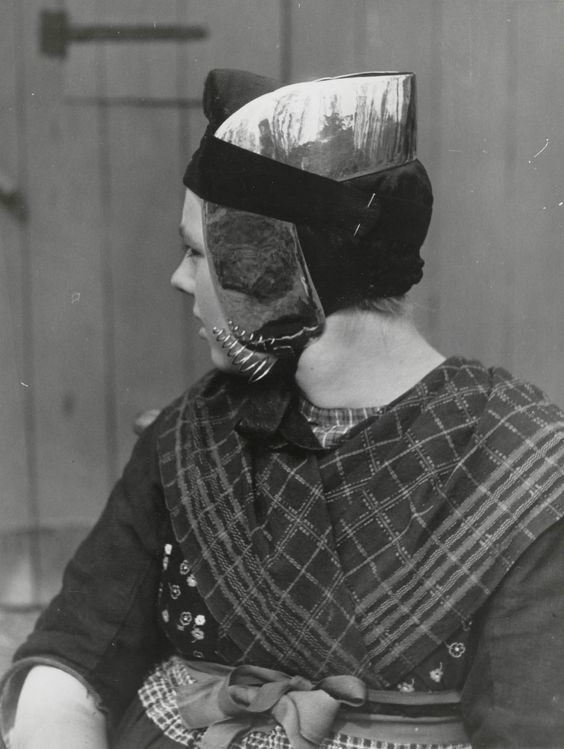 Oorijzers are a type of metal headgear which have been worn in the Netherlands for a very long time. Literally translated the name means ‘ear-iron’, but I don’t think there’s an official English word for them, so I’ll keep using the Dutch term. I wanted to just write one post about oorijzers, but it became a bit long, so this is part 1 of 2! In this article I’ll give a little background on the history of the oorijzer and one example of it’s continued use throughout history. The next article will be about the oorijzer in various traditional Dutch costumes! Just a quick disclaimer: I’m writing this article as an interested layman, I’m not a scholar on this subject by any means. My information comes from museums and books, and I’ll try to give an overview of sources at the bottom. 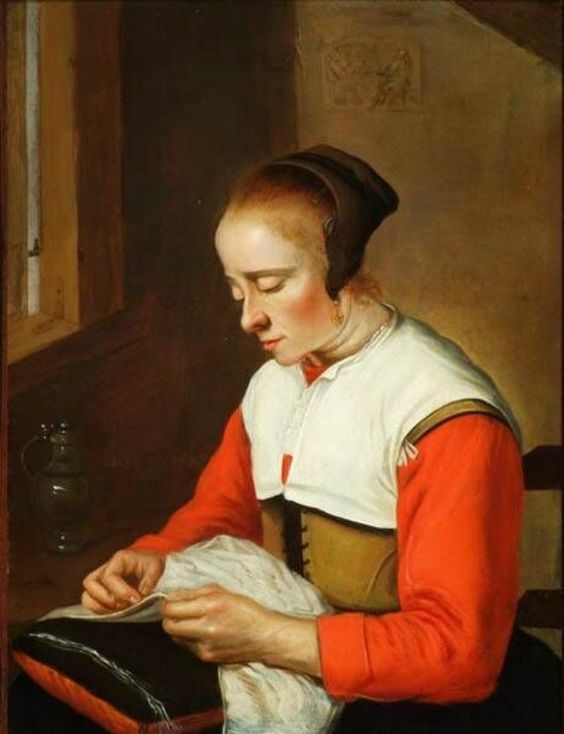 I’m also writing this more as knowledgeable on Dutch traditional costume than on 16th and 17th century dress, to give an idea of my perspective. But back to the topic on hand! What is an oorijzer? The basic description would be ‘a piece of metal worn on the head underneath a cap’. That’s a very bare description, mostly because the function, appearance and material of the oorijzer all changed throughout time and place. Below you see a collage of different existent oorijzers ranging from 16th to 20th century, all worn in different parts of the Netherlands (source for all images: Het Geheugen van Nederland ). 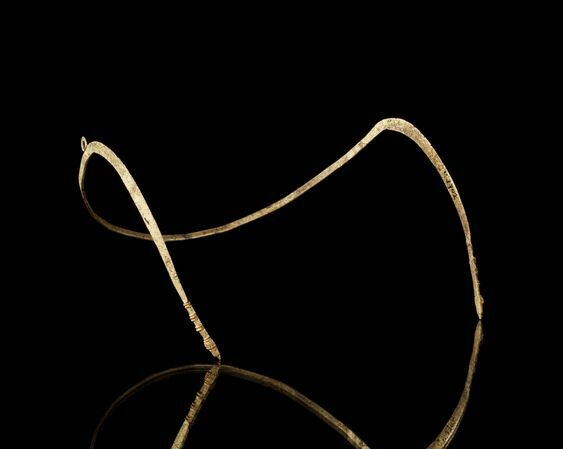 In origin, the oorijzer was a simple wire often made of brass. It was worn around the head and meant to keep the cap (which was worn on top) in place. It was a very utilitarian object, of which the largest part was not seen. The tips could be a little decorated with wire or small knobs, because these would stick out a little in the front. The rest of the wire was narrow and undecorated. 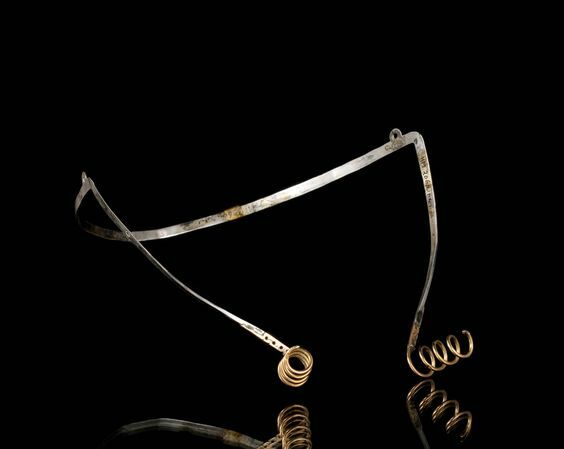 Below is a brass oorijzer with copper wire around the tips found in Amsterdam, believed to be made in the 16th century. This is a good example of the style and shape of oorijzers around this time. This type of oorijzer was worn throughout the entire country as a part of regular fashions of the time. These would’ve gone out of fashion for the elite around 1650. The lower classes would keep wearing them for a little longer. After 1700, you see oorijzers mostly in regional and local wear. Although the earliest examples of oorijzers are twisted wire, at some point you also start seeing plated (I’m not sure if this is the correct technical term for how they’re made, sorry!) examples with little loops attached. The one below is from the last quarter of the 17th century, made of gilded brass. This one might’ve been for a wealthier woman, given the gilding and decoration of the knobs. It might have been worn with an early version of regional clothing as well, given the date. The oorijzer would be made such that it would grip the head, preventing the cap from sliding off. The cap could be pinned to the ear iron. Because it was a bit tight (otherwise the grip wouldn’t work), you often see the knobs or ends making indentations of the cheeks of wearers. Although few oorijzers from the 16th and 17th centuries have survived (being the practical accessories they were), they were worn widely. Luckily for us, the 17th century is a great era for the Dutch painters. Even though most of the upper class stopped wearing them at some point during the century, lower class portraits were also done. This means a fair number of paintings have survived which show women wearing oorijzers. Below a small selection. In the 18th century the oorijzer disappears from regular fashions. In some regional costumes the oorijzer disappears (if it ever existed at all, sources pre 1700 being scarce). In others though, it is kept on and starts to transform. The 18th century is the base of most of the regional traditional costume we see today, it’s when the differences start becoming larger. The same is true for the oorijzer, which becomes different for different regions. One very interesting place where the oorijzer is kept is the Burgerweeshuis in Amsterdam, the main orphanage in Amsterdam. Founded in the 16th century, the orphanage was quite well known and located in the same place up to 1954. The uniform for the girls was very distinctive, with dresses which were black on one side and red on the other, worn with white caps including oorijzers. After the oorijzer goes out of fashion in the 17th century the orphans keep wearing it and it serves as a part of their dowry when they leave. Throughout time it grows a bit from the 17th century version, becoming wider. 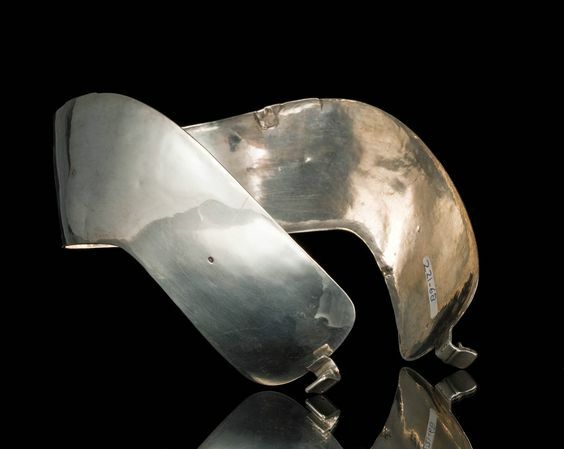 The oorijzers worn in the Burgerweeshuis are eventually made of silver, making it one of the most valuable possessions the orphans were likely to have. The costume, including oorijzers was worn up to 1919 when they stopped wearing the uniform. This is an example of a costume which is not as much regional but institutional, but which therefore stays nearly the same for centuries. I couldn’t find any pictures of the uniform before late 19th century, so these images below best reflect the uniform as worn in the last years. Below is a print of the costume made in 1914 after a doll (date unknown, but I’d guess late 19th/early 20th century) which clearly shows the silver oorijzer beneath the cap. At this point, it has become wider than the original 17th century oorijzer and the little knobs are high on the head. The painter Nicolaas de Waay painted a good number of paintings of girls of the Burgerweeshuis in the early 20th century. This is one of his portraits, again clearly showing the oorijzers beneath the caps. 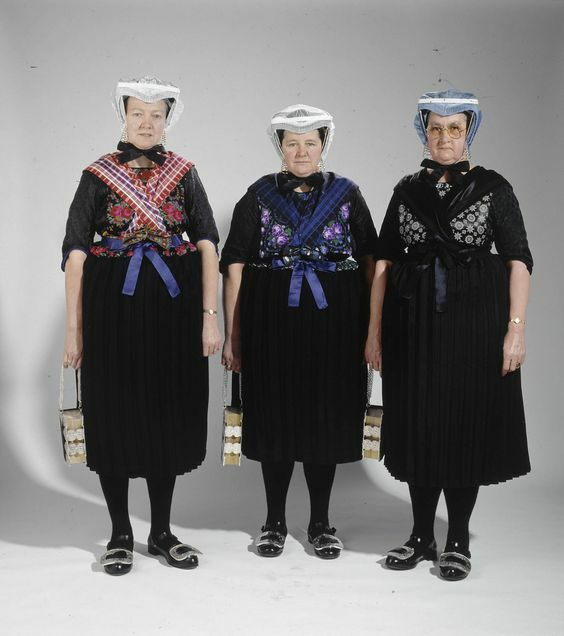 Currently, most Dutch people know the oorijzer purely from their use in various traditional Dutch costumes. In Part 2 of this topic I’ll attempt to give an overview of how the oorijzer evolved in different regional wear, and how they’re still worn today! This is another post about the drawings by Jan Duyvetter of Dutch traditional costume, made in the early ’50’s. 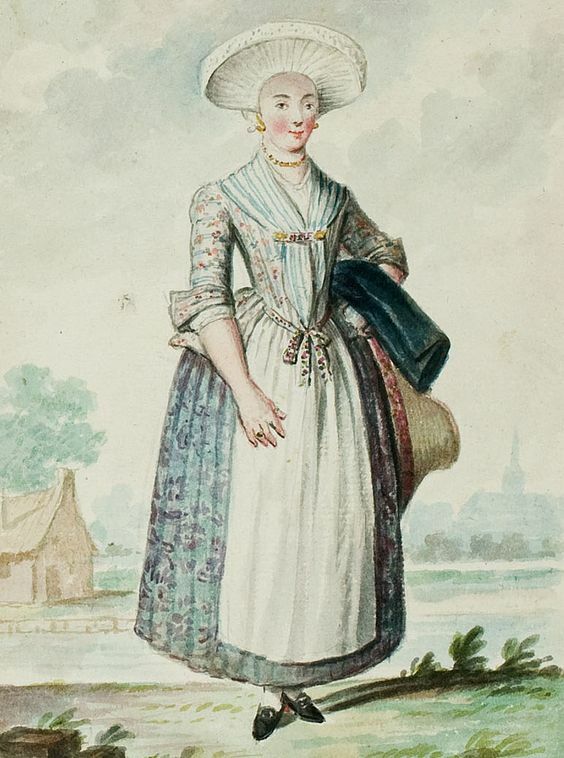 The previous post showed an 18th century Frisian lady and her clothes, in this post an image from the same time period, but a different region. The drawing is of a lady from Zaanstad, a place right above Amsterdam, most known for the ‘Zaanse Schans’ with it’s mills and characteristic houses. The costume in this area disappeared in the late 19th century, but by then was already much different from the image below. The general sihouette of this lady is similar to that of the 18th century Frisian costume, which makes sense because it followed the fashions of that time. 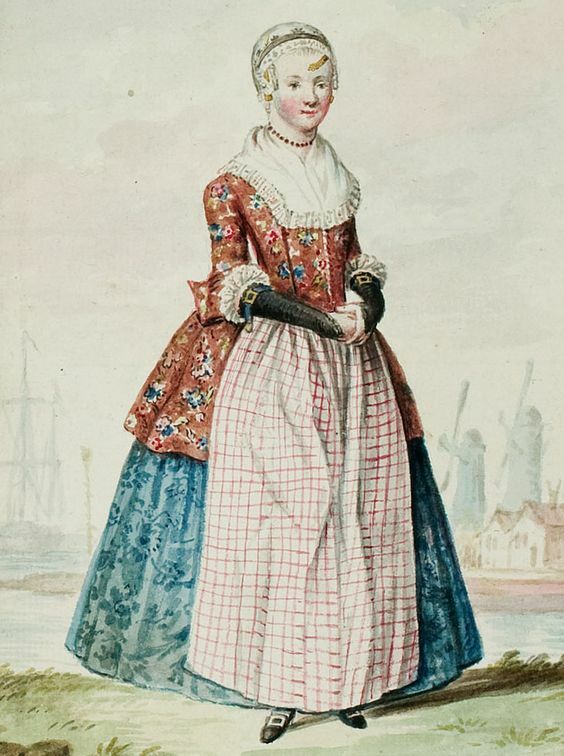 A conical bodice, and a skirt worn over wide panniers. The panniers are slightly wider in this lady, which might have something to do with the fact that this location was closer to the big city and therefore to modern fashion. This area was also a rather rich one, and this is a costume worn for visiting. The lady is wearing a ton-sur-ton skirt, with a hint of colorfull petticoat peeping out underneath. 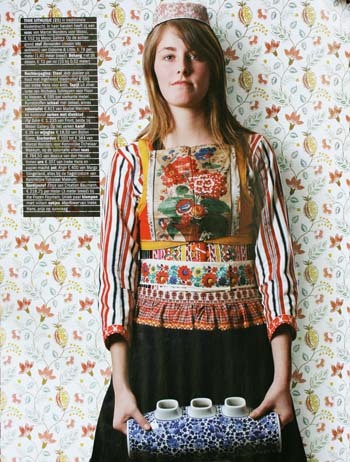 Over this, she wears a wide checkered red apron, with what looks like a decorated ribbon at the waist. The jacket is long and had 3/4 trimmed sleeves. She wears a fichu at the neck and trimmed mittens. Her headgear is, again, very typical for this area. She is wearing several pieces of jewelry with the cap. 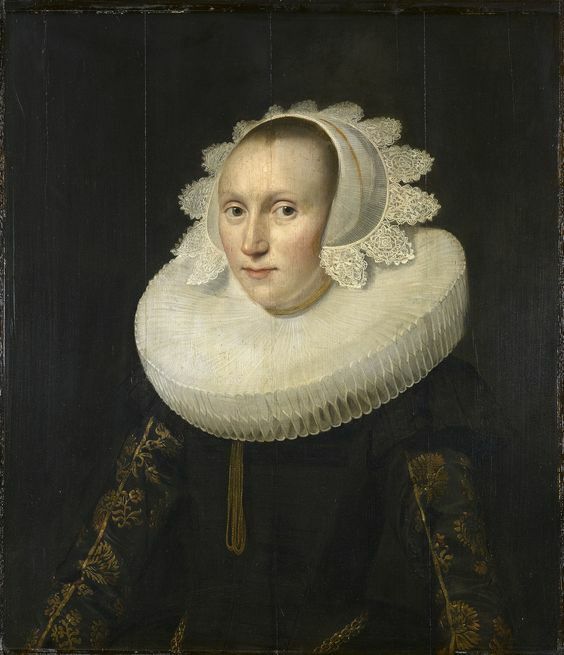 The piece on the forehead is called a ‘voorhoofdsnaald’. 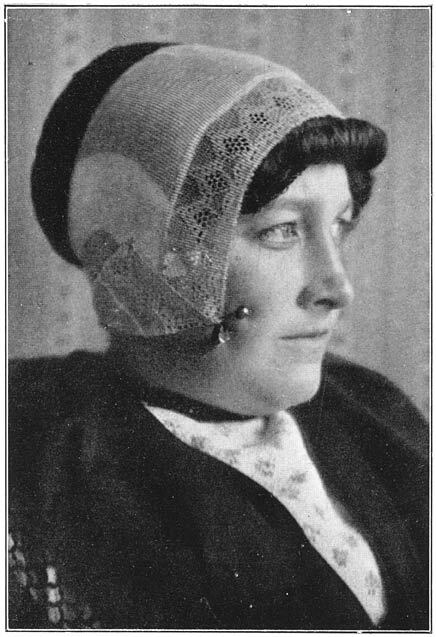 The other pieces to the side are ‘ear irons’ and extend to below the lace cap. 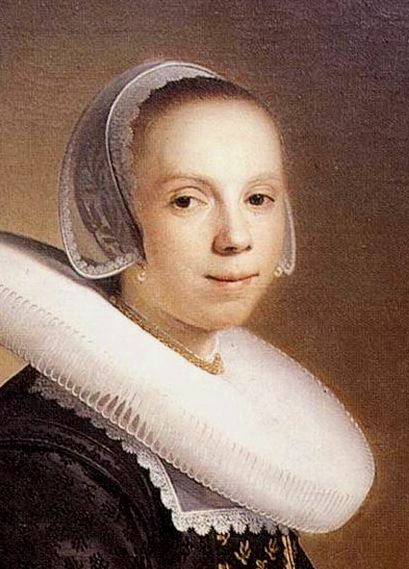 On top of the lace cap, she wears a cloth which was known as a ‘kaper’. 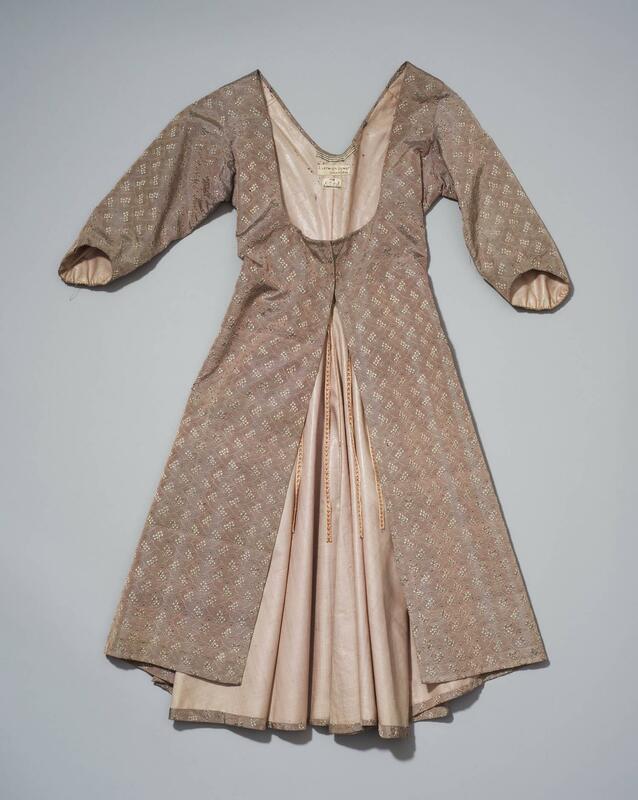 The rest of the post shows existing garments as worn with this costume in the 18th century. The real-life counterparts of the image. ‘Kaper’ of blue silk. Worn over the lace cap. Ear-iron. Worn under the lace cap. 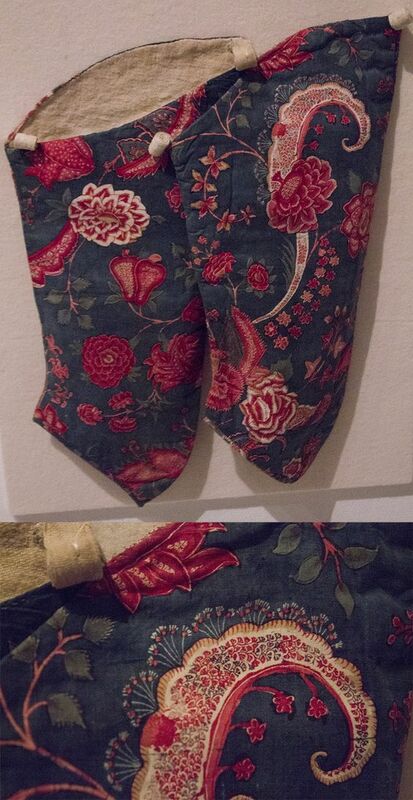 These are from the 19th century, but still similar to those worn in the drawing. Cap pins. Worn just behind the decorative part of the ear irons, they were pinned through the cap. Again, these are 19th century in make. ‘Zijnaalden’. These were worn as jewelry by pinning them into the cap, so they lay across the forehead. One was worn at a time. These are early 19th century in make. Jacket. These were made out of several fashionable colors and prints, mostly out of glazed cotton. Petticoat. Many were made out of chintz fabric. 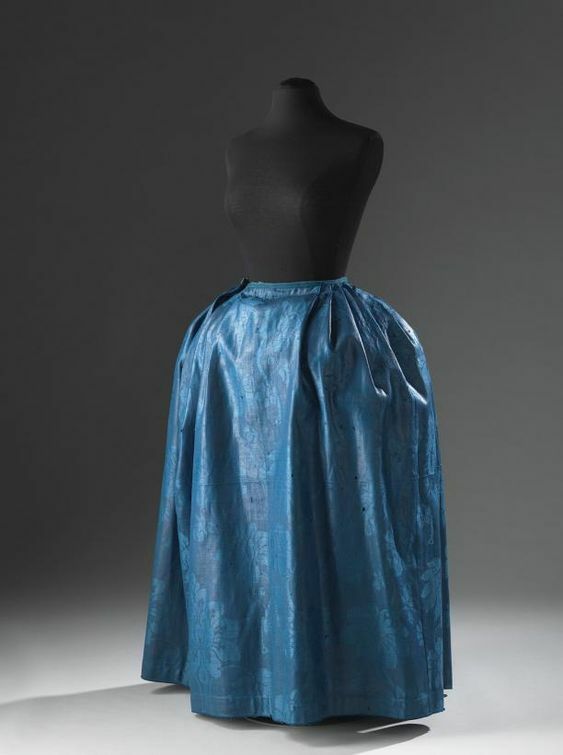 There are also some examples of solid color quilted petticoats. Skirt. These were also made out of different colored and patterned fabrics. 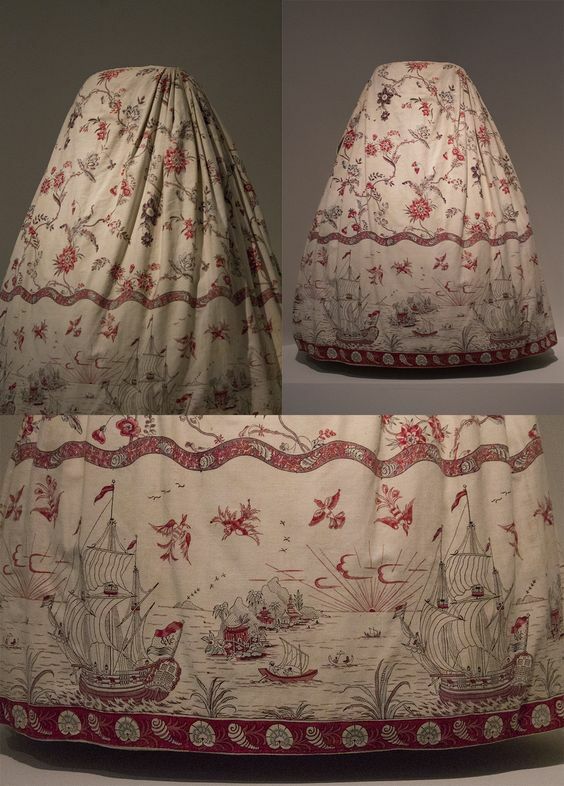 This is a ton-sur-ton as in the image, but are also extent solid or chintz skirts. Apron. The top was gathered over the tie string. This post will be about the traditional costume of Marken. Marken is a small town on what used to be an island in the inland sea the ‘Zuiderzee’. Around 1930, the ‘Afsluitdijk’ was built, a very large dike (or levee), which closed off the entire Zuiderzee from the North sea, making it into two very large inland lakes now called the ‘IJsselmeer’ and the ‘Markermeer’. This had a large impact also on the village of Marken, as the people lived off the sea. In the 1950s, the island was connected to the mainland with another dike officially making Marken a peninsula. 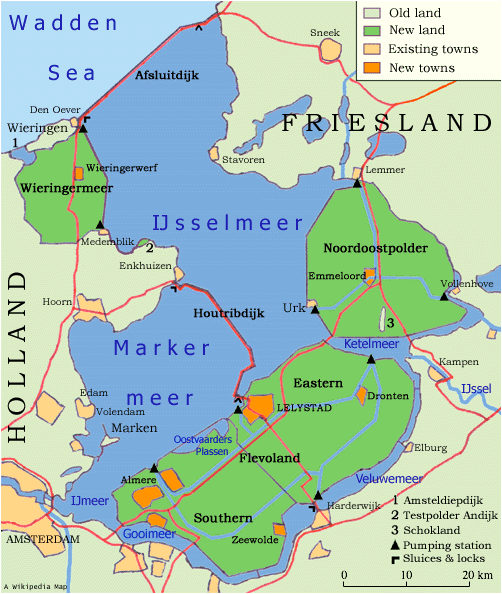 A map of the Markermeer and IJsselmeer, including Marken. The costume exists of a colorful striped underskirt and a dark over-skirt, a blue apron with a checkered top, a shirt with either dark blue (winter) or striped sleeves, an embroidered corset, and a red over-jacket with a square of flowered fabric pinned on. All together, the costume of Marken is very bright and colorful. The following are some images to get an idea of how the costume is built up. This is the shirt worn under the corset and jacket. Only the sleeves show, so only these were made in the more expensive striped fabric. Over this shirt, a corset, or bodice was worn. I always think it’s a shame that you can only see a hint of it between the skirt and the jacket, because they’re usually very beautiful. 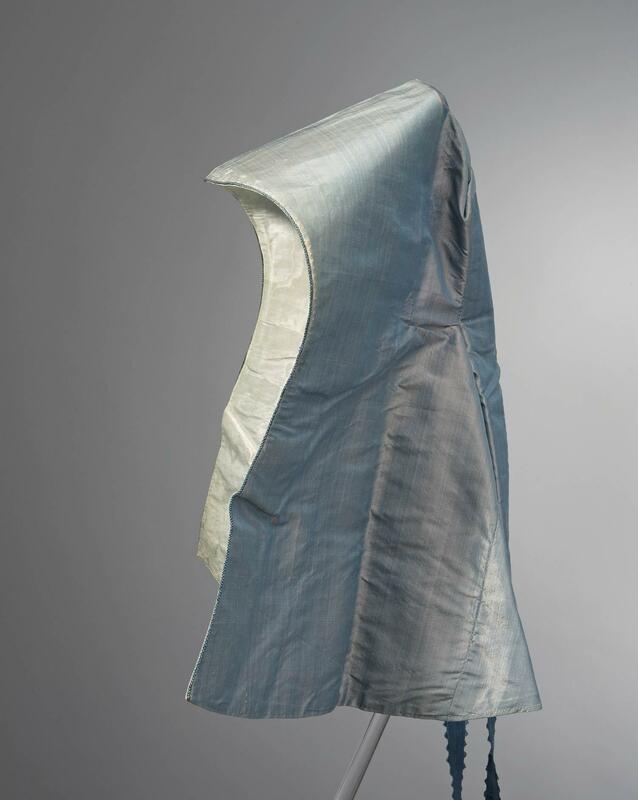 This dressform is not wearing the overskirt or the jacket, so you can see the corset. 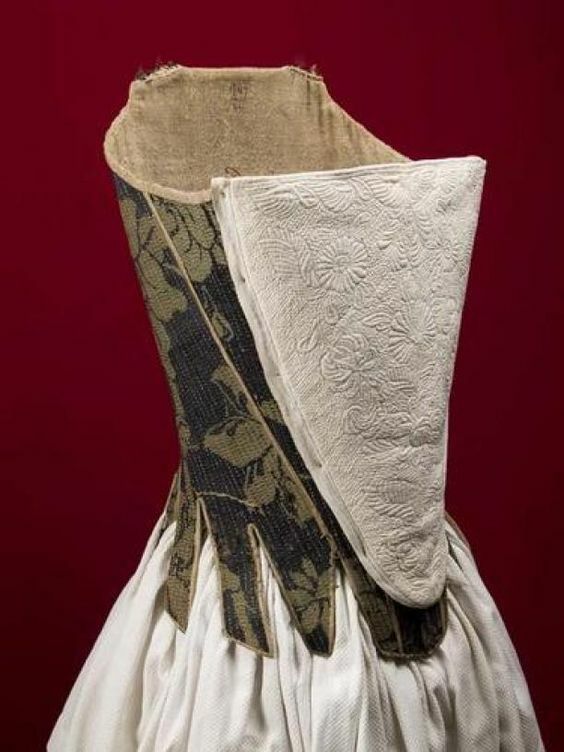 A shorter corset. This one has darker colors and purple, so is worn in mourning. The red jacket, which is blue at the back, is worn over the shirt and corset. This was called a ‘bouw’, and was pinned on the center of the jacket. It was always made of flowered cotton. 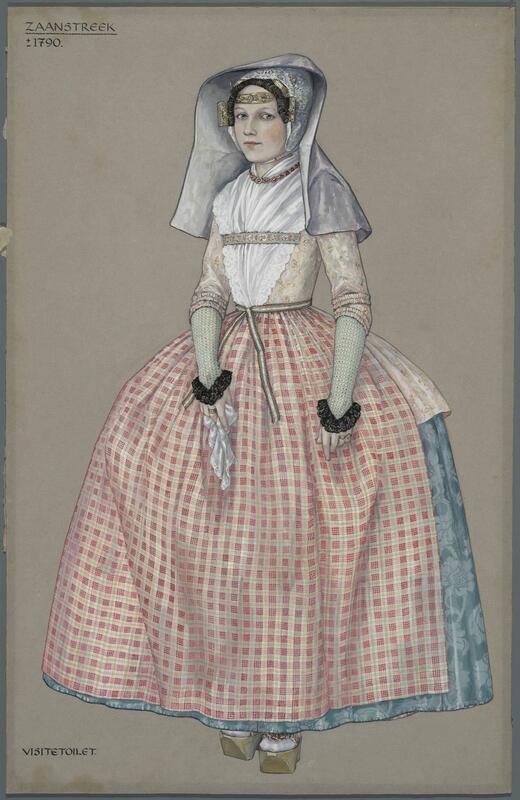 A drawing including the over-skirt, bouw, apron and the headwear. Girls wore almost the same as their mothers, boys were also in skirts until a certain age. They could be distinguished from the girls as they wore a checkered instead of a flowered ‘bouw’, and a slightly different hat. The Marken costume has many variations, most noticeably those for weddings and Pentecost. These are some beautiful pictures of variations of the costume. A bride costume, for the afternoon church service. A bride, in the morning. Daily wear for heavy mourning in summer. The costume also has a very distinctive traditional hairstyle. A large part of the hair is brought forward and cut into bangs, and two large pieces are kept long at the sides to fall down in curls. The back is shaved off and is hidden below the hat. Obviously, this hairstyle only works if you wear the traditional head wear. This is what it looks like without the headdress.